I wasn't planning to write a post tonight, (still on a high from yesterday's card pull) but this is sort of important. I've officially started my NHL duplicate box today. Since I began collecting them, I've been shuffling the duplicates around in boxes mixed with other cards, or small boxes- I've outgrown three of them already. I prefer to store my duplicates in Avon boxes- which I can't get anymore. My mom used to be in Avon specifically to get these boxes. When they discontinued using them, she stopped doing Avon. These are the boxes I prefer to use for my duplicate cards. My NBA duplicate stash takes up 8 of them...NASCAR one...a mixture of everything else in another. Now, the NHL officially has one. I'm not ready to put up a tradelist or move any of these yet, but I want to remember this date. I have no idea when I began using them for the NBA, but it was probably around the year 2000. I planned to start putting the cards in the box on the exact 1 year anniversary of watching the sport, but I didn't get to it until now. The oldest card in the box is from 1979-80, the newest 2017-18, as can be seen on the bottom right. 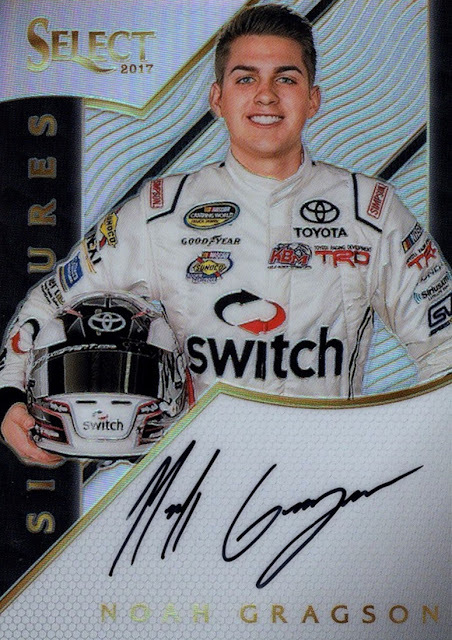 Since some of the cards I was given in 2015 are not in the greatest shape, I don't want to trade any of the cards I've gotten now until I am sure they are not upgrades. Not sure when I will get to that. Eventually, when I am sure, the undamaged cards will either be listed on my tradelist here, or sent to COMC. 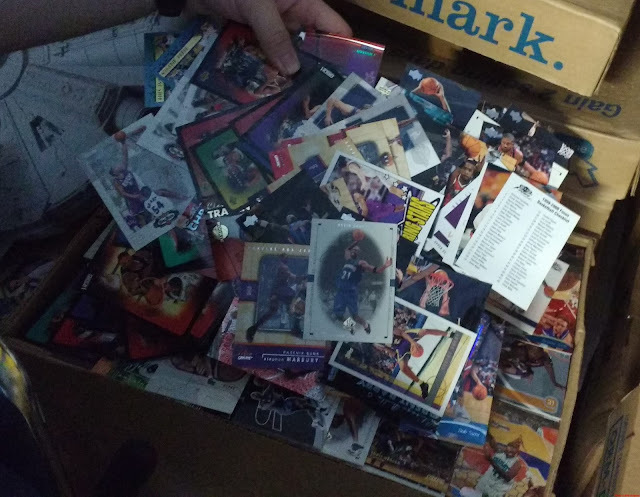 One of my planned things to do in the future is totally sort my NBA boxes- I have not been through them in years, other than the one I have been working on for a while. Most I have not seen inside of since 2003 or so. I've posted about them a little bit already. Since there are 8 of them, that's a lot of cards to sort. I have no idea how many cards each box holds. I think it's about 2000, but that's a totally wild guess. Maybe if I remember I will count the contents of one of them someday. Here's the one I've been working on for a couple of years now- it's got most of the duplicates I've gotten since I got back into the NBA, minus the ones I've sent to other collectors, COMC or put on my tradelist on the Trading Card Database. I had forgotten that I should store the cards the other way in the box, not remembering until I looked in the boxes in my storage unit. At some point I'll rotate these. I should have done it today as I had all the cards out of it trying to find one I promised in a trade on the Database but I was pretty flustered so it never occurred to me. 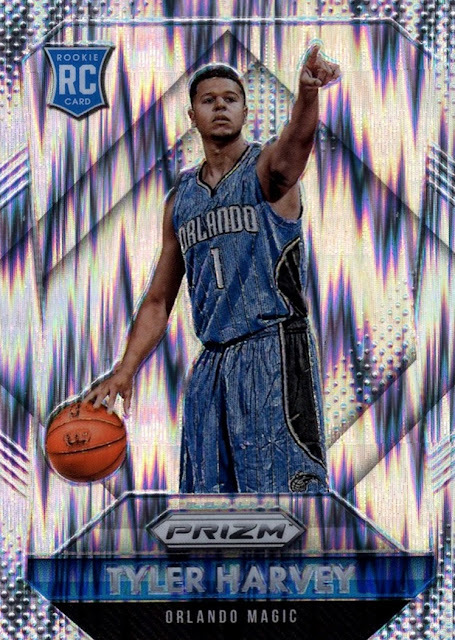 If you look on the bottom left you'll see the damaged Juwan Howard card I posted about earlier this month. Did I REALLY just pull this card?!? If I'm dreaming right now, please, don't wake me up! I purchased a box of Portfolio from the Dave & Adam's Black Friday sale, and I've opened less than half of it...I was truly surprised to pull this card! Without hyperbole, this may be the best card I've ever pulled. It's certainly my best Hockey pull. It's also only my second hobby box in the sport! I'm still amazed and can barely believe I pulled this. WOW! That's two pieces of leather and two fabric. I don't know for sure what kind of material the leather is, as I'm still learning about hockey, but all I can think of is the boots? Maybe the gloves? I wish they told you what it was on modern cards. By the way, it will NEVER be for sale, ever, under any circumstances! I'm in a lot of card groups on Facebook, but I rarely make any purchases. I'm not sure why because there is always something interesting for sale, I just don't do it often. This month I actually made two purchases and thought I would write about them. Both were on the NASCAR card forum I am a member/moderator of, although the first one was actually a purchase of basketball cards. One member posted that he had some basketball he wanted to trade for NASCAR. It turned out I didn't have anything he wanted, so I just bought the cards I wanted from him. This unlicensed oddball is a highlight. 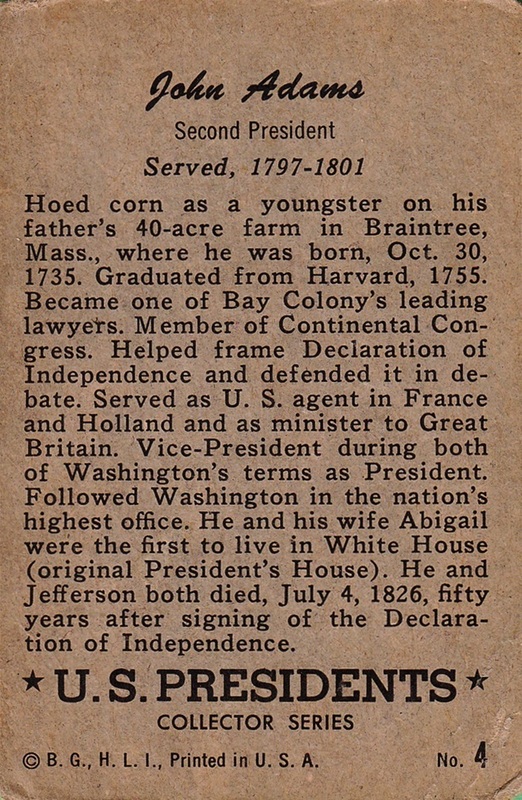 It was part of an 18 card set that included some college cards. 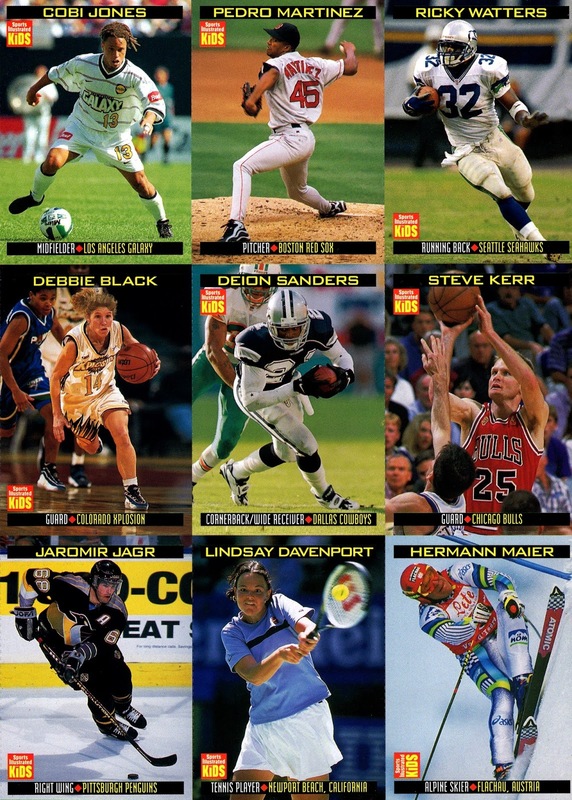 They also did a multi-sport set. I had never seen it before. Although it didn't scan that way, the border is gold foil. 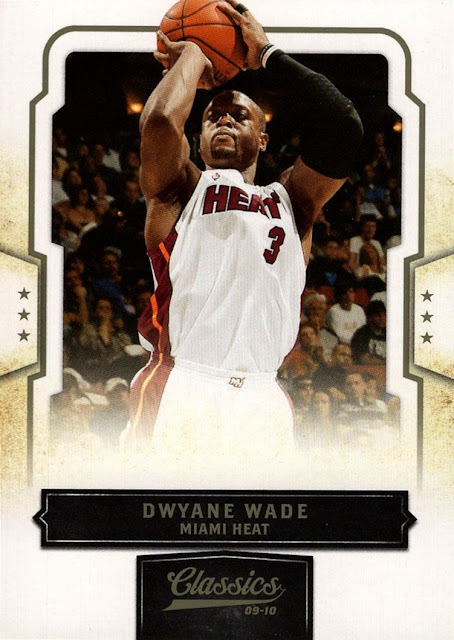 I don't have a lot of cards from the time period of 2006-07 through 2010-11, and I got three singles from the 09-10 season. 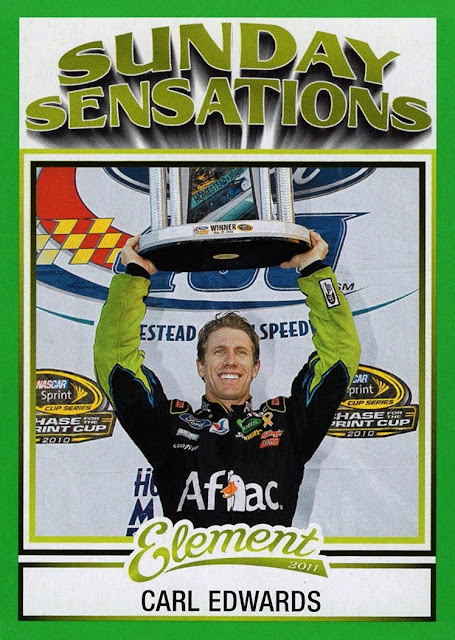 This is actually my first base card from 09-10 Certified, although I did have an insert from the set previously. I have a few more cards from 09-10 Classics, but less than 10. 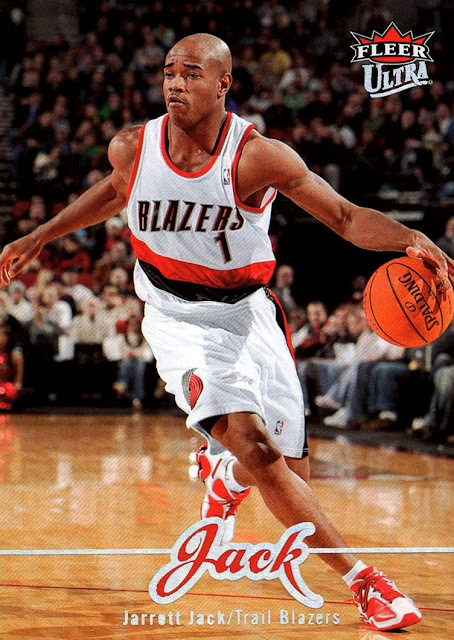 There was also a Russell Westbrook card from 09-10 Threads but I didn't scan it as it was already done on the Database. I got it mixed in with all the other cards I've set aside to scan later and didn't want to go looking for it after I decided to make this post, more than a week after the cards arrived. Scott Skiles on-card auto from 2013-14 Timeless Treasures, SN299. It's my second autograph of him. 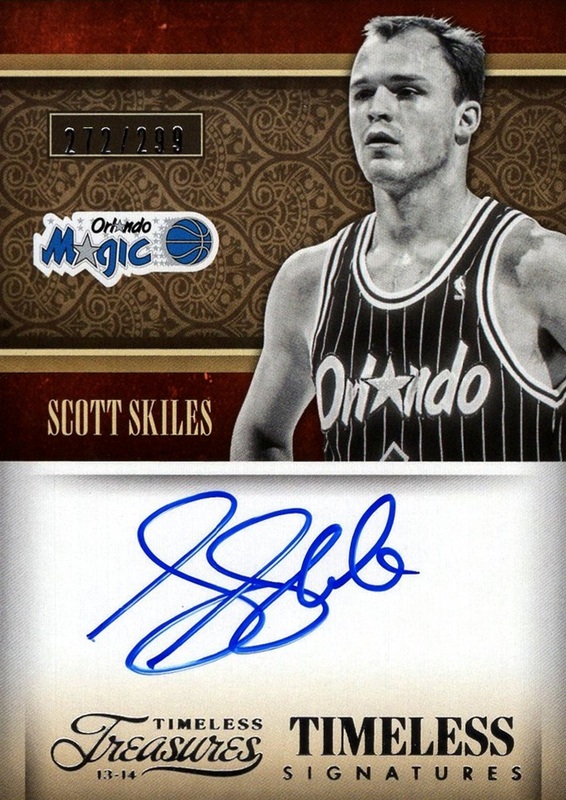 Not a huge fan of Skiles but for the price I paid I won't turn down any NBA autographs. My first auto of Campy Russell, also from 2013-14 Timeless Treasures. 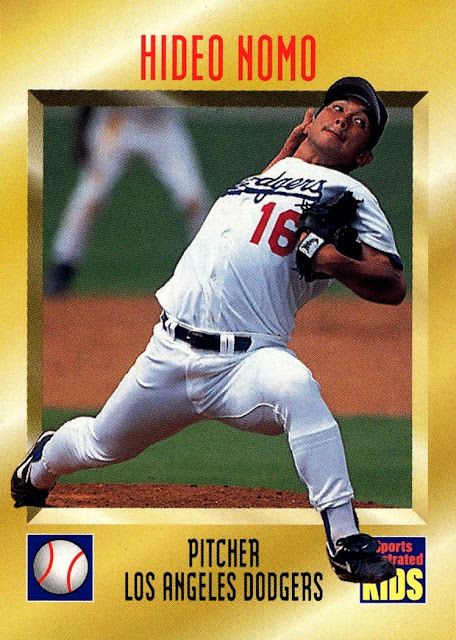 I think this may be my favorite card from the purchase, even though it's not serially numbered or a base card. 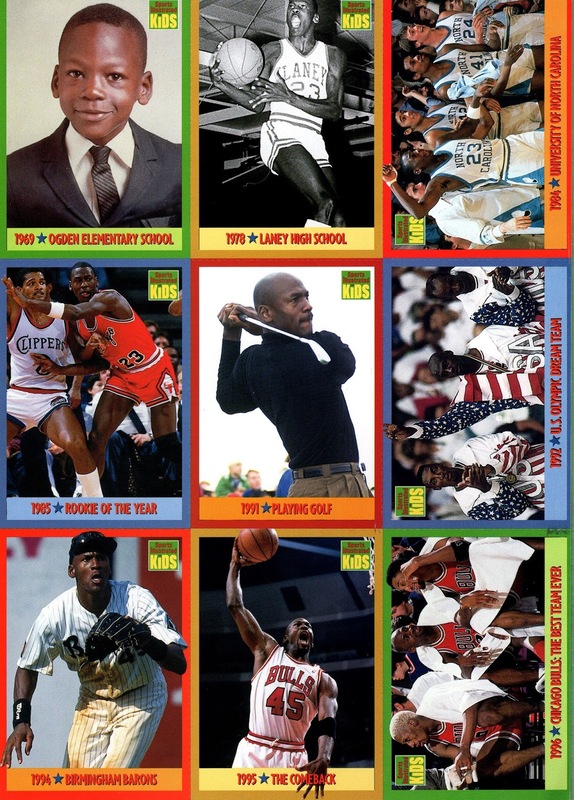 Just a few days later, I commented in a thread someone started that was "What project are you working on right now" and I posted about my project of trying to get one card of every person to get one in my three sports. One of the members had several cards I needed so I ended up buying them. 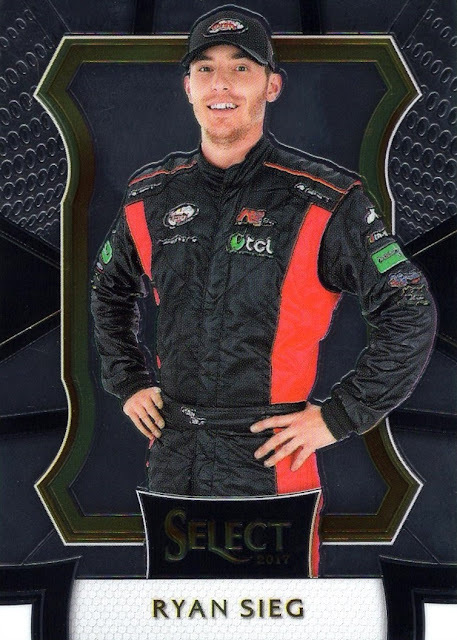 I have done one blaster of Select and Torque this year and that's probably going to be it- not that I don't like them, but that's just how it is. That's 8 new people, half of them autographed at that! It brought my missing NASCAR people list down to 25. Pretty cool, all things considered. The Blue Prizm parallel from Select is serially numbered, as is the Red, White & Blue parallel shown of Jones. 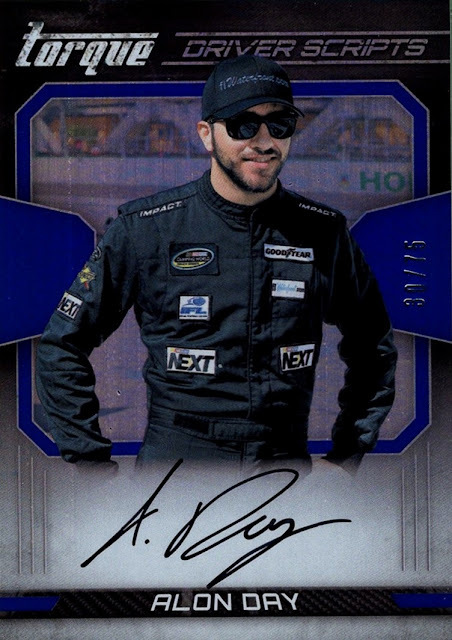 Alon Day is the first NASCAR driver from Israel. 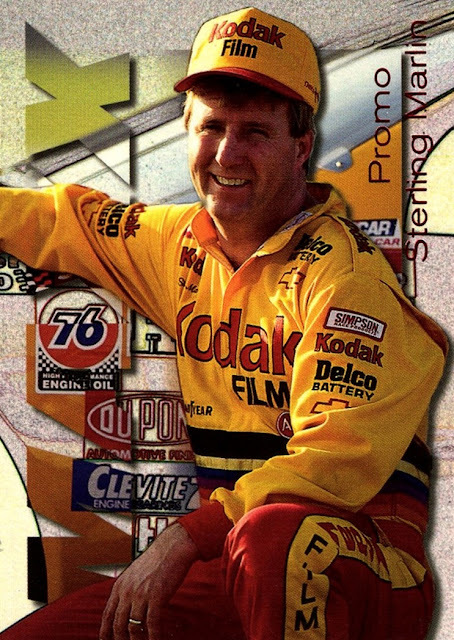 He's the only one of the 8 who have run in Cup so far, I think. I have to admit that I don't pay as close attention as I used to. 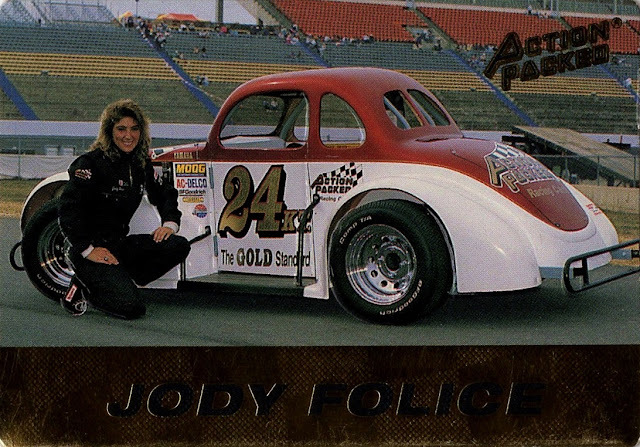 Back in the day...even just a few years ago...I would have known for sure, and what car they drove, and possibly even where they finished...but I'm losing that stuff as my interest in the sport is waning, wholly due to the changes they have made to the actual fabric of the sport. 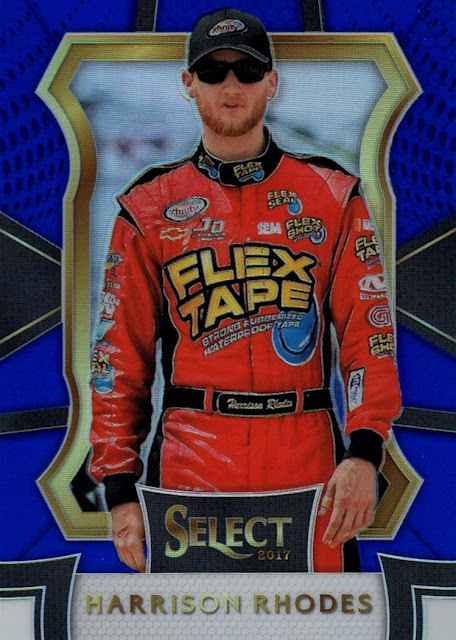 Even so, I still plan to collect the cards- I bailed on the NBA in 2006 when I was not very happy and I now consider it to be one of the biggest mistakes- if not THE biggest- I've ever made, so I will keep collecting and watching NASCAR even if I don't like it very much- I don't want to make that mistake again. And in case you are wondering, Brandon Jones is actually 20 years old. I'm glad to see some of the K&N drivers - Busch North and Winston West to me- getting some cardboard. 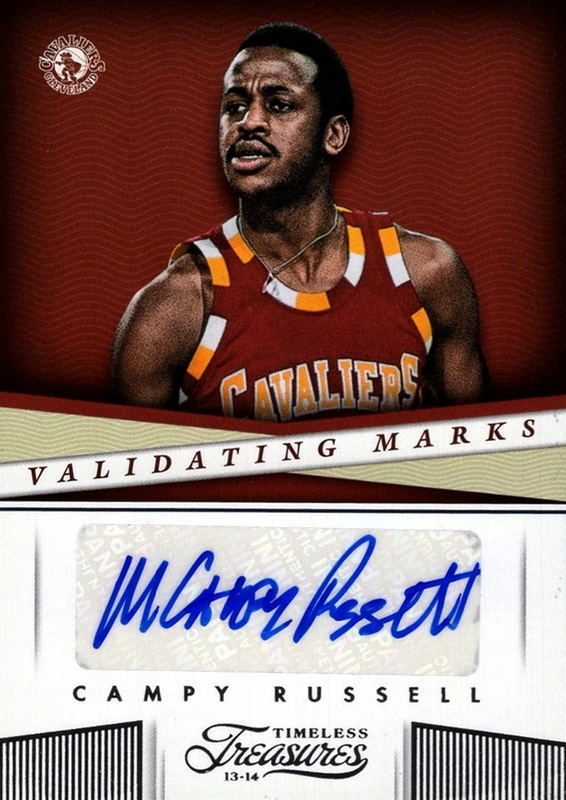 It's pretty rare to see them on cards, but Panini is including them in some of the autograph sets. 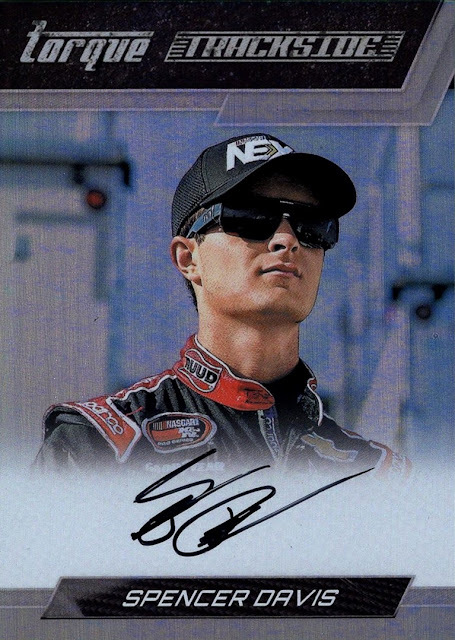 That makes it a little harder to collect them- the cards are rarer, and autographs are more expensive than base cards- but at least they are getting them. There have been literally decades where they didn't get any recognition at all. 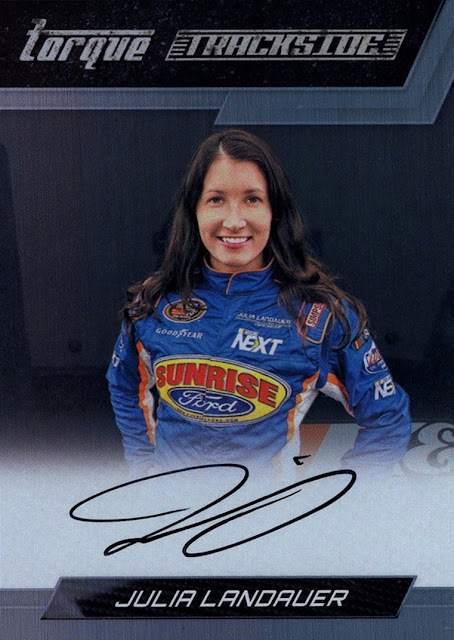 Julia Landauer and Spencer Davis have never gone higher than the K&N series, although both hope to some day. 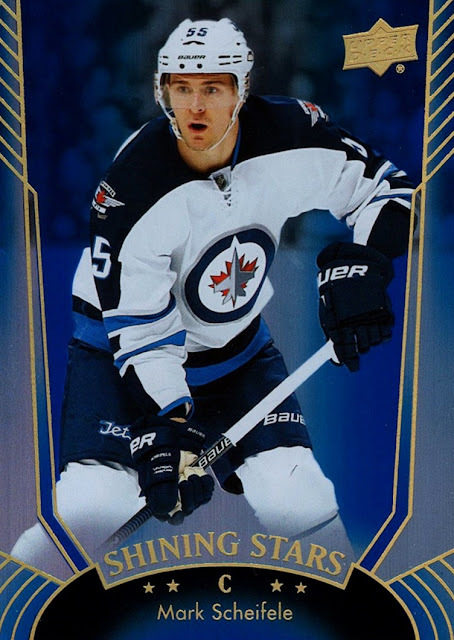 My brother and I went up to the mall to pick up this year's Christmas ornaments, and hopefully pick up a blaster of Hoops and Upper Deck Flagship, so I could open my first pack on my 1 year anniversary of becoming an NHL fan. (see my previous post) Well, our normally well stocked Target wasn't. 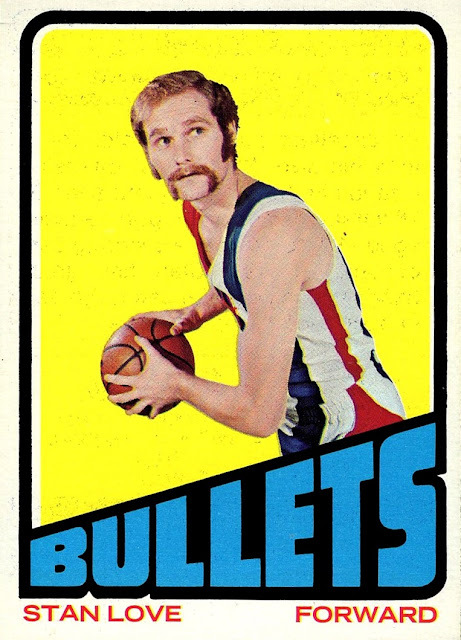 Hoops was already gone in Blaster/fatpack form, and the wall hanger box was almost empty. (I did snag some packs out of it). Upper Deck's flagship hockey set was not in the store at all. It was either already sold out, or, more likely, never put out yet. Our local Target is USUALLY well stocked, but sometimes they are not. 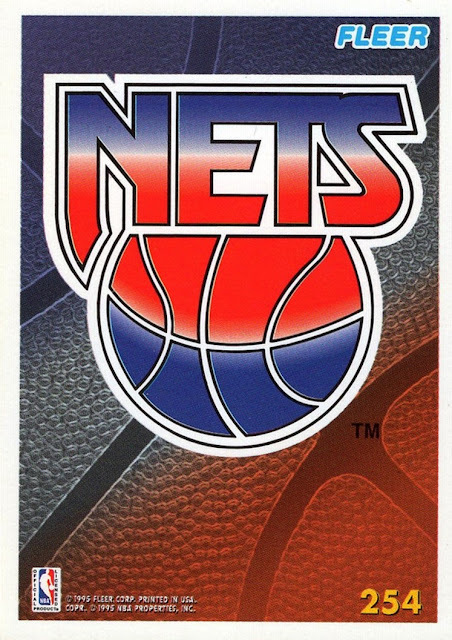 There have been a couple of times where they didn't get an NBA set out until after the NPN already expired, for example. So, I struck out there. There was only ONE pack of 17-18 Panini Stickers for hockey left in the store, so naturally, I consoled my striking out on my intention by buying this pack. And all this was before the Black Friday insanity! Just because I feel like it, and have not posted much lately, I'm going to share the contents of the anniversary sticker pack here on the blog. Since it was something I did special for my anniversary, it should be documented for all time, right? I'm going to pretend what I have to say is important enough that it is. 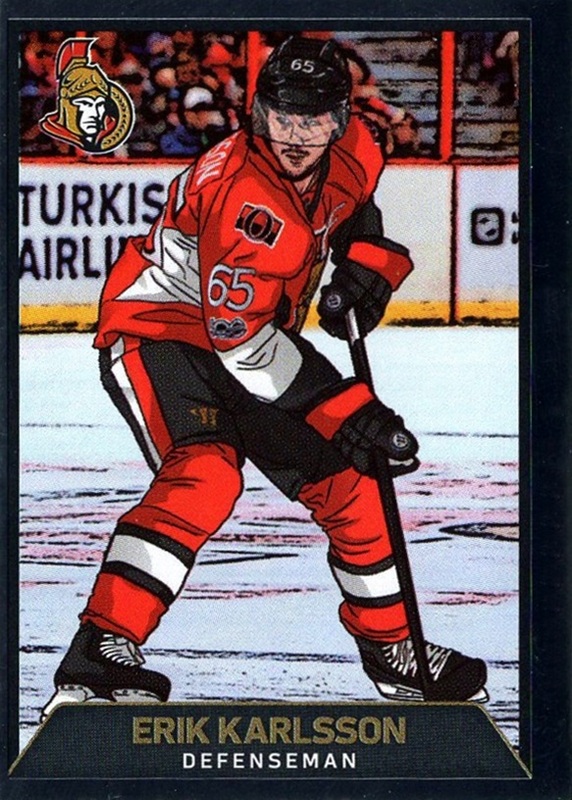 This drawing of Erik Karlsson was first out of the pack. 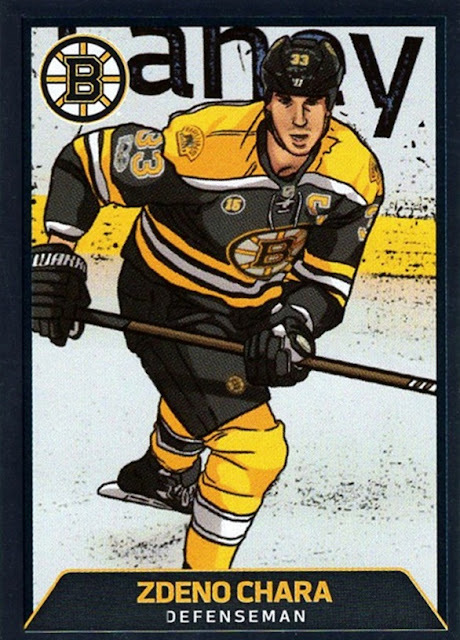 Panini currently does something in their hockey sticker set called "Illustrated Players" and this was my first example from this year's set. 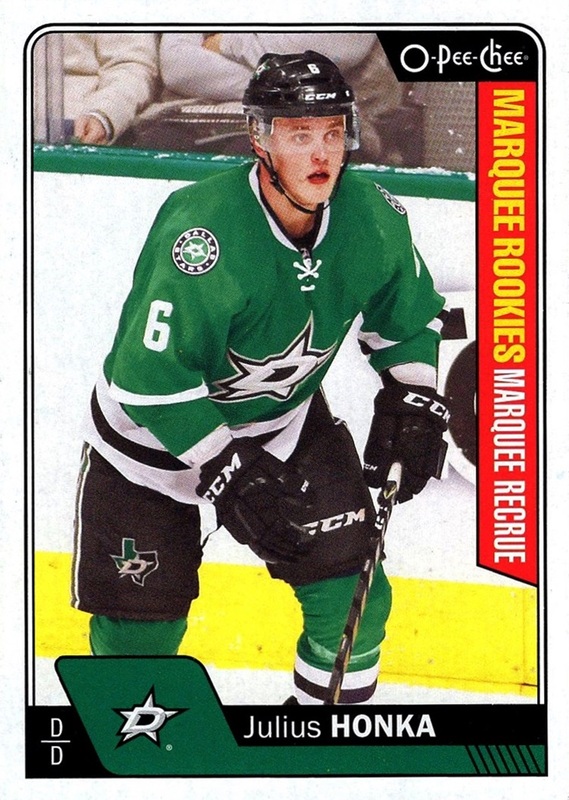 (This is the 4th pack I've opened) What he did against the Rangers in the playoffs last year was pretty darn amazing considering he was playing with a broken foot. Two drawings in a row. 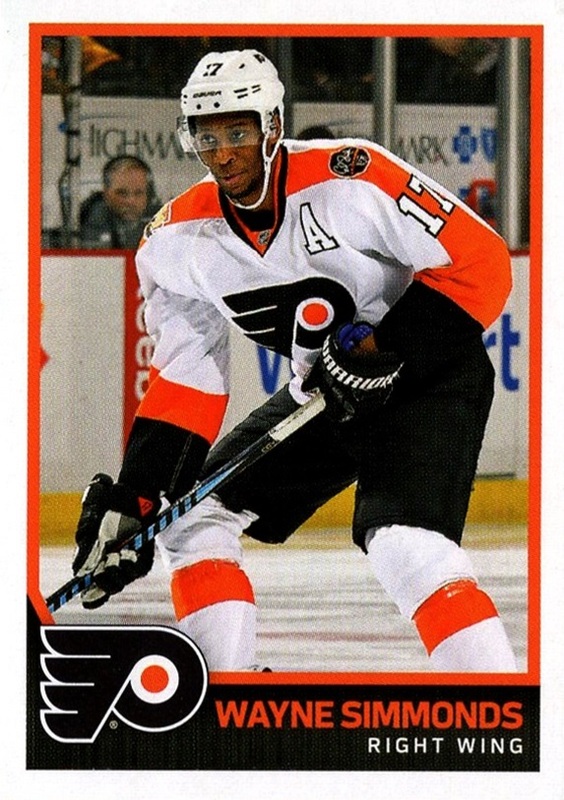 I don't know what it is about hockey that allows players to have incredibly long careers. Chara has been in the NHL since 1997, and that's not even talking about Jaromir Jagr who's been in since 1990! Wayne Simmonds is going to go down in history as my first All-Star MVP. He got a pickup truck for that. 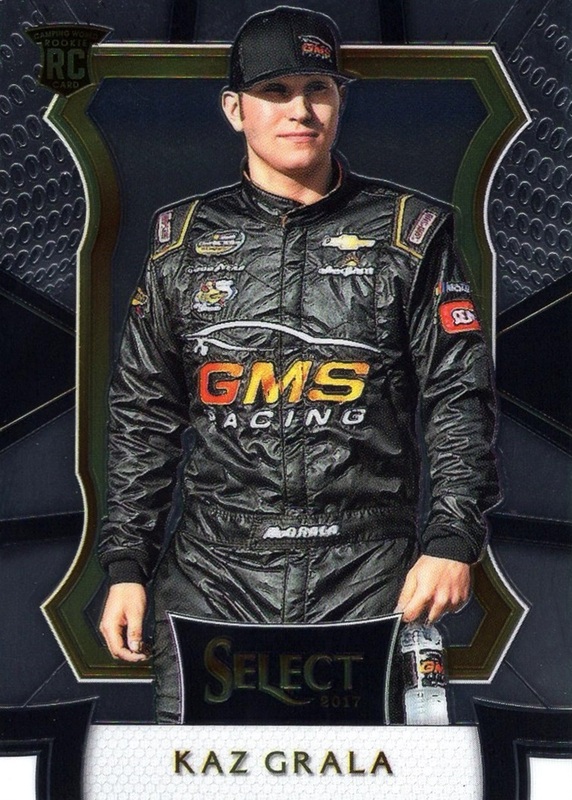 Every time I get a card or sticker, or see a highlight of him I start thinking "Take On Me" even though the band was Aha and not Aho. Close enough that my mind makes the connection. This is his third time appearing in my collection, and I don't think I've spelled his last name properly even once yet. Not on purpose, I just keep leaving out a letter, this time it was V. Usually it's the F. Luckily, the way my paper listing works, it doesn't really matter if a name is spelled right, as long as it shows the card is present for that number. And no one will ever see it, which is good because the way I've mangled things over the last 20 years is laughable/embarrassing. He has a dog named Pickle. Seriously! With Blogger's "Extra Large" setting, my preferred for card images, these are actually going to show up larger than the stickers really are. Panini does a good job with them, I enjoy them quite a bit. Like I mentioned before, this was my 4th pack of the season. I wish I had gotten more, but they are pretty much impossible to find once my local Target sells out. You never see them in repacks. I do count them as part of my collection now, I wish I had gotten more of them over the years when I had the opportunity. 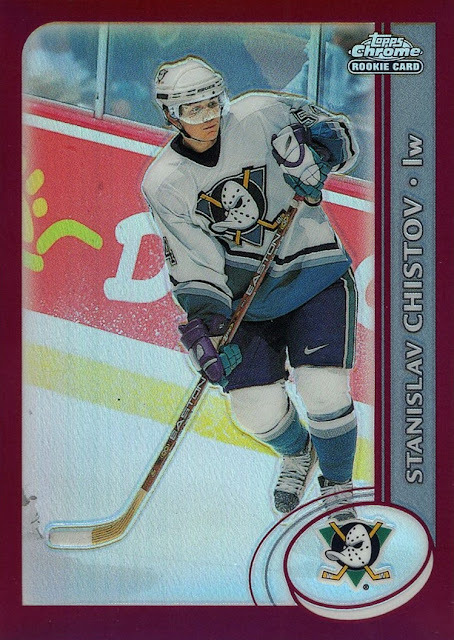 I was hoping to get a Golden Knights sticker- this set was the team's first appearance on a card (or something close enough that I count it as a card) but no such luck. Nor did I get any new people for my collection, or any Rangers. I'm not unhappy though, because there were no duplicates and it brings me 7 cards stickers closer to completing the set. 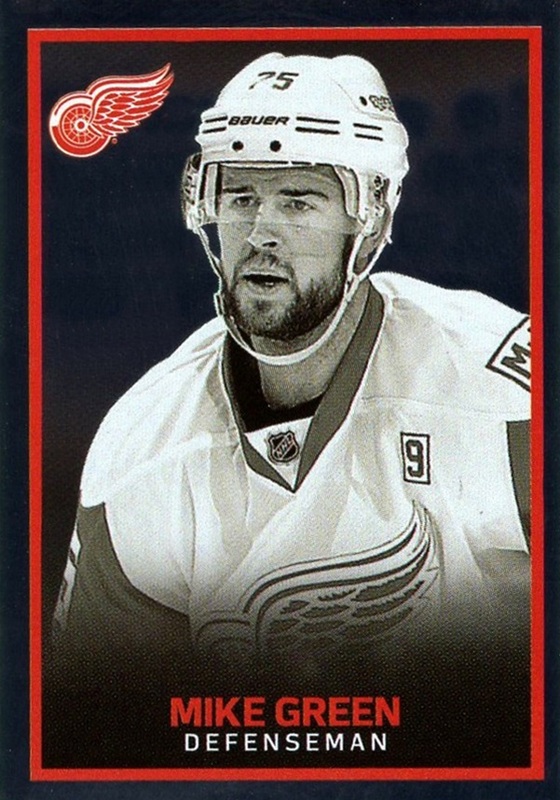 I also opened a pack of 2010-11 Upper Deck Series 2 and 2011-12 Victory that I got at a sports collectibles store in the mall, but all of those cards were already done on the Trading Card Database, so I set them aside for future scanning someday. I did get new people in those packs, and you can see them on the bottom of the NHL tab on the "People in My Collection" page. I just wanted to plug a favorite feature I have not talked about much. I can't even remember the last time I went to the mall beyond Target, but it was a fun trip even if I didn't find everything I was looking for. I watched in secret until January 14th, when I wrote up this post and revealed to the world that I was now an NHL fan. The amazing thing is that I was able to keep it a secret from my mom and brother, I knew I was not going to be able to keep it a secret for long. I wanted to be sure that I was really a fan, and that this wasn't going to be some passing fad or infatuation that would fade in time. It sure hasn't. I don't remember the first game I actually saw...but I do remember the first one I saw from start to finish. That was the Winter Classic, the outdoor game, between Chicago and St. Louis on January 1st. Every other game previously I caught after it had already begun. Since that time, there has not been a single day where hockey did not play some sort of role. 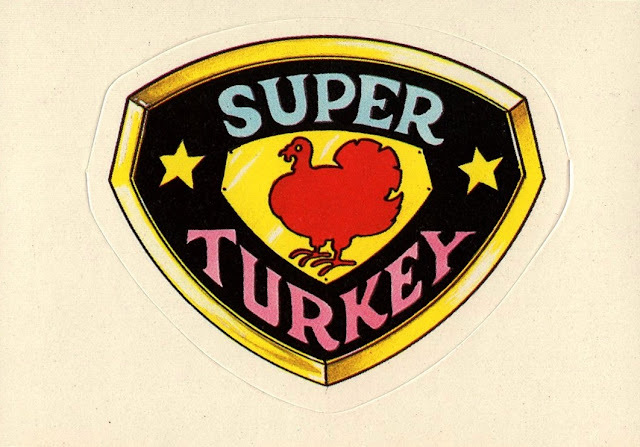 Even during the summer, when there were no live games being played, I was watching repeats on TV, or finding old clips on YouTube, and dealing with the cards people sent me- I'll get back to that in a moment. It's just an integral part of my life already, and has already surpassed NASCAR in my list of favorite sports. I still list the NBA first- but I actually watch more NHL games in their entirety. Hockey now takes up a large part of my life, and I am thrilled about that! Although I credit the Golden Knights with getting me into the sport, there are a couple of other things that could have...should have...gotten me into it sooner. My poor eyesight is why I didn't...I had tried in the past. I just couldn't see what was going on. In 5th grade, I played floor hockey in school...my favorite sport to play, and the only one I was actually good at. I used to watch roller hockey on ESPN, and I also enjoy field hockey in the Olympics. Air Hockey is a lifelong favorite- my brother is really incredible at it. 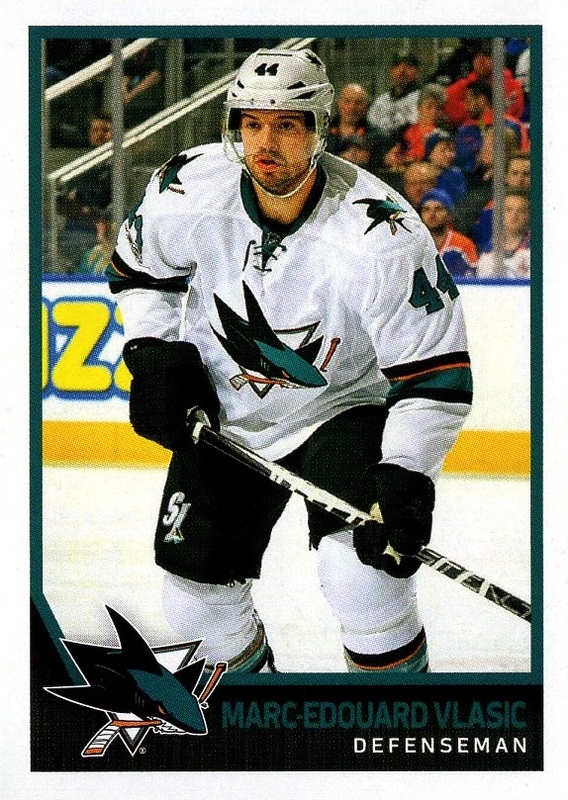 If it was an Olympic event, he could still win gold, despite being in Jaromir Jagr's age bracket. Because I've been playing him all these years, I'm pretty good too. Not as good as him, but if I play somebody...I win. Unless I'm playing him. These days, I can only play three games before my back gives out, if I'm lucky- I wish I could play more. Even though I usually lose, I still enjoy it every time. He sometimes lets me win, but in 30 years of playing, thousands of games, I've only ever beaten my brother fairly maybe 4 or 5 times. I've never lost to anyone else I've ever played against. He's that good. If my TV hadn't died in earlier 2016 I might not have been able to become a big fan that I am now. It was old- about 15 years old- and one day it just wouldn't turn on anymore. I began watching everything on my phone, via my cable provider's app. I put that right next to my computer, (So I could charge it via USB while watching) and can look at both without even moving my head- just my eyes. That played a huge role. If I had to look up and to the right, I probably would not have actually watched and then woudn't have become a fan. If the phone was not in HD, I probably wouldn't have been able to follow the puck and not know what was going on. Also, by putting it on the phone right next to me, I could actually hear it. When my TV was on, halfway across the room, I would have to lower it at night and usually couldn't hear what was happening. My brother gave me my smart phone only in May of 2016. Although it's technically a phone, I don't use it for calls. It's basically a handheld TV to me...and also a better camera than my actual camera! And now, back to the cards. 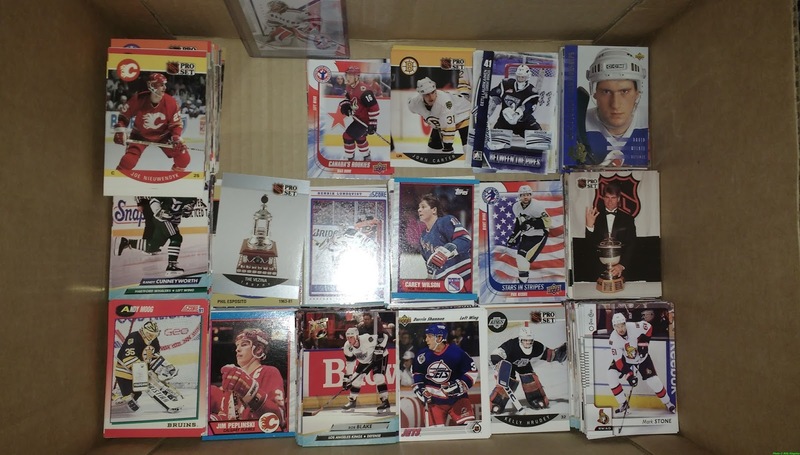 Hockey card fans have been incredibly generous to me, over the past 11 months. Once I made my announcement, linked above, that I was a hockey fan and going to begin collecting hockey cards, they started rolling in from my fellow collectors, usually as gifts. And not in small quantities. In the thousands. 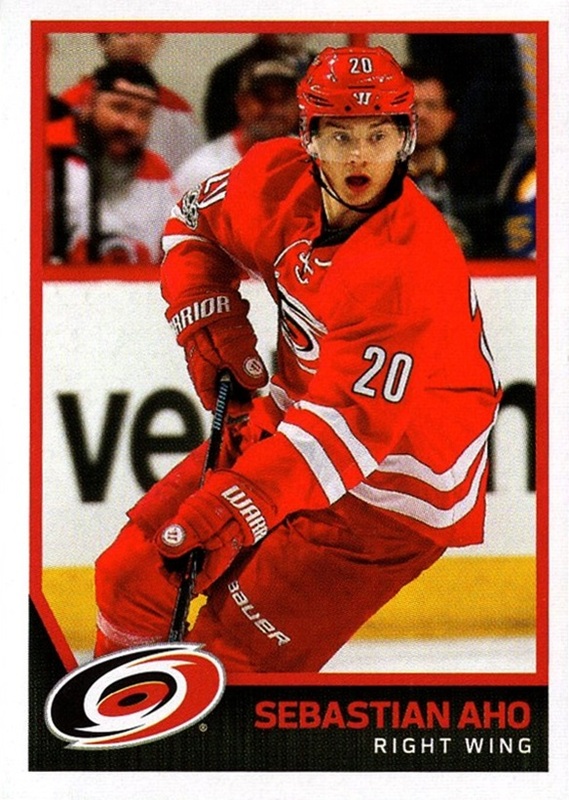 I keep track of how many new cards I get in a day, and in 2017 two gifts from hockey collectors rank in my top 5 all time new cards in one day...#1 was also mostly hockey cards, from a friend in 2015, who is a big hockey fan and thought I would enjoy it, so he sent me almost 3000 cards to get me into it. In a way, it worked, because I really enjoyed the cards he sent. They are the backbone of my collection. 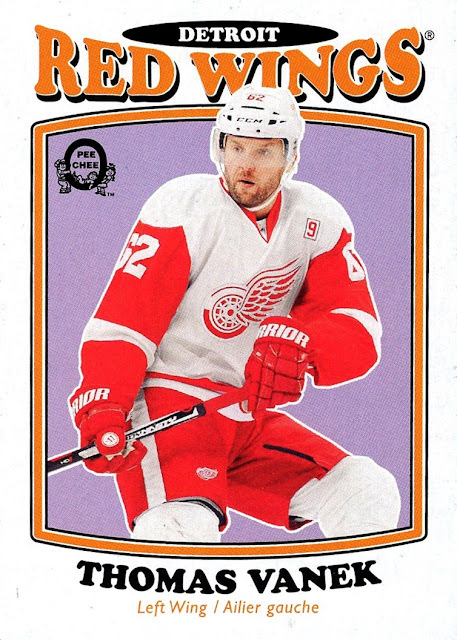 I began 2017 with exactly 3000 hockey cards, and as I am writing this, I have over 8000. 8346 to be exact. While I have purchased some for myself, the vast majority have come as gifts. My fellow hockey collectors have nearly tripled my collection in under a year's time! That's just....incredible. Truly. I don't have a superlative compliment that can properly express how grateful I am. I'm not sure that word exists. And it's even more than that, because I've held some of the cards back for next year, when I celebrate my 30th anniversary collecting cards. (More on that in January). Of the 5346 new hockey cards I've gotten in 2017, I purchased for myself maybe 1500 of them, through packs and repacks. Maybe a little more, but maybe a little less too. The rest all came from friends. Isn't that just the most amazing thing? I hesitated slightly, due to the vast expanse of different people who have gotten cards, but I decided that I would indeed add the NHL to my project of trying to get at least one card from every person to ever get a card in the sport. Doing that project for the NBA has been exceptionally rewarding, and I've also done NASCAR, coming fairly close to completion in fact. I have not yet made a list of who is missing for the NHL, but it's going to be a lot. Getting cards since the 1920s, 20 years before the NBA and NASCAR were even founded, let alone got cards, there are more NHL players with cards, and in fact, the different people represented in my hockey collection is already within about 400 names of my NBA collection, which has been my main focus since 1996, essentially. This is a project that I don't think I will ever finish, but I am sure going to have a lot of fun trying over the coming years. I am a fan of every team, and I will watch whoever is on. It doesn't matter. I will watch it and enjoy it. And not just the NHL, I also watch minor league games when they are televised. Of course, I watch the Golden Knights a LOT. But in that time between when I started watching and when they started playing, the New York Rangers had become "my team". 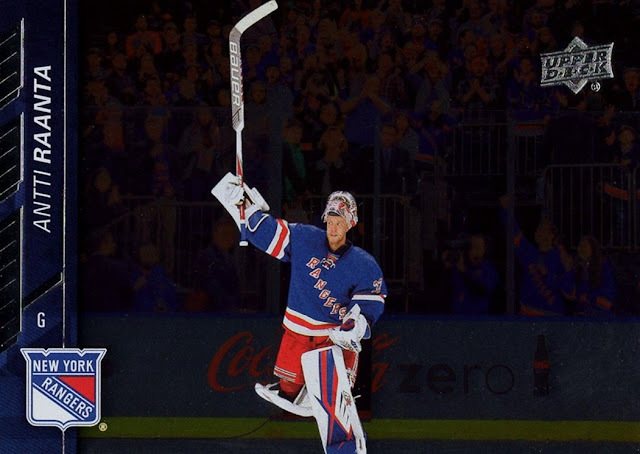 From the steady stoicism of superstar goaltender Henrik Lundqvist, (my favorite player in the league), to the scrappy determination of Mats Zuccarello to the enthusiasm of Brady Skjei (who does not yet appear in my card collection) and everyone else on the team, they have captivated my attention and become "my team". I realized the Rangers had become my team when I missed a game last year due to my schedule, and reading the scores the next day, being sad that they lost, instead of just reading the scores to see what I had missed, something I do each and every day. I don't know what date that occurred, but I know it was a loss to the Calgary Flames. In time, I am sure there will be a stratification of the teams for me, where I find I root for some more or less- it's already begun. 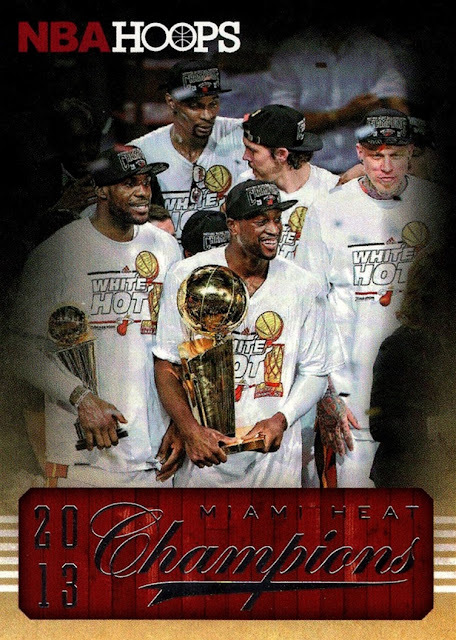 But last season that didn't yet occur, it was just information to be processed. When I was sad they lost, I knew, then and there. 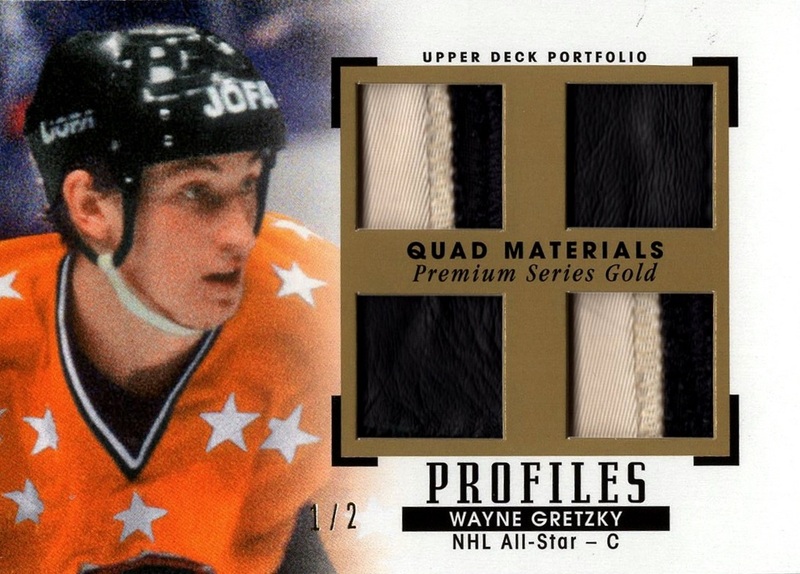 I am eagerly looking forward to getting my first Golden Knights card. I know they have existed since early October, with the first appearing in the Panini Stickers, and also two inserts in O-Pee-Chee, and the first set showing images of the team in action appeared in the Upper Deck Flagship which came out a few weeks ago, I have not been able to get to the local Target to get any. I hope they still have them if/when I do get there. One interesting thing, I have been a sports fan for many years now, but I had never seen the first game of a team's history until this year, when I saw the Golden Knights play their first games. Either pre-season or regular season, I saw them both. So, today marks 1 year since I've been a hockey fan. There will never be a time in my life where I can't say that, so it's year 1 of many. Thanks to all the hockey fans and fellow collectors who have sent me cards- as I tried to relate above, I can't thank you enough! A 36 card set, notably larger than the current standard size, I have 19 of them- but none of them are in particularly good shape. They took quite a beating before I got them in late 2014. Although I loathe politics, I love history, and that gives them a place in my collection. 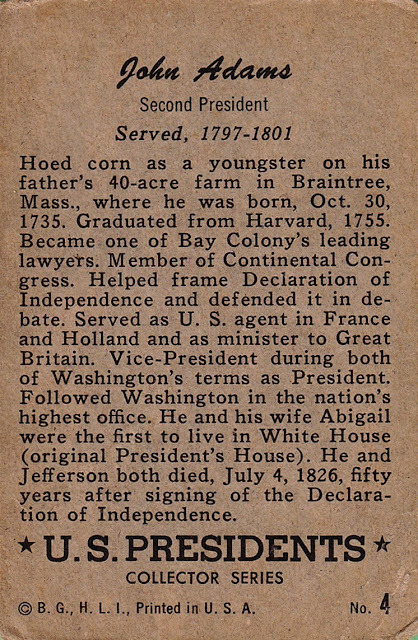 Some of the cards in the set were not of presidents but of presidential related things, like the Declaration of Independence, and the White House itself, George Washington got two cards. I don't have either of the two Washington, or Lincoln. Those three are the keys to completing the set. While I normally like to get cards in better shape than these are, I also couldn't pass them up! Each card features a drawing of the President with a background relating to something that happened in their term- or, in the case of then-current Dwight Eisenhower, before he became President. As you can see from the scans, the condition is poor...but like I have said repeatedly, I'd rather have a low condition card than none at all. This post was written on November 19th, 2015. Time to get through some of these long-in-the-queue posts! Are you reading this on your phone? In the past two decades, the cell phone has become a ubiquitous part of life. I know only one person who refuses to get one...everyone else has one, I even have two of them, one smart phone and one stupid phone. I can't imagine life without them, especially considering that since my TV died in 2016, I have been watching everything on my phone...it even allowed me to get into hockey. But cell phones were not always the miniature computers they are now. 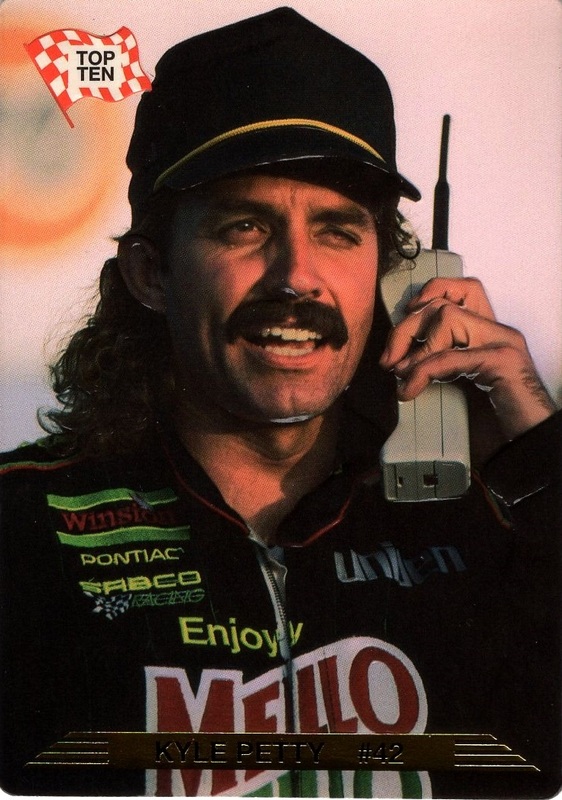 This photo, taken in 1992 and appearing in the 1993 Action Packed set, may be the earliest card to show a cell phone. 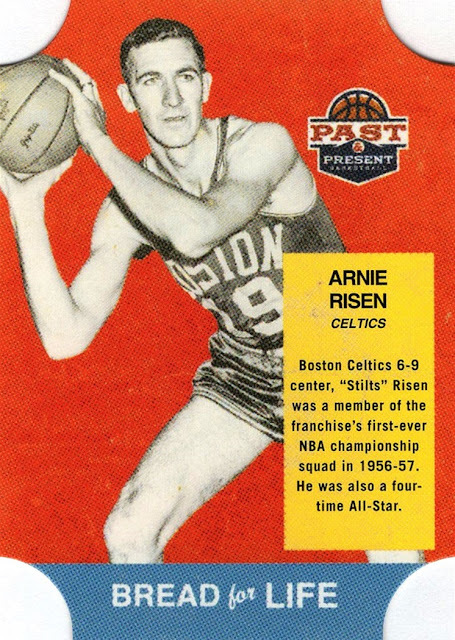 It's certainly the earliest card I've seen to show one. 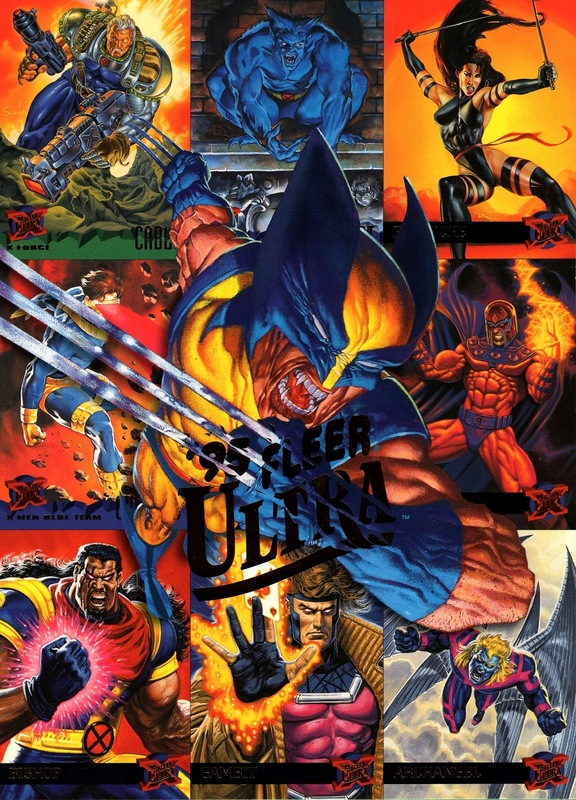 And, because it's Action Packed, it's also embossed, because that is what they did. 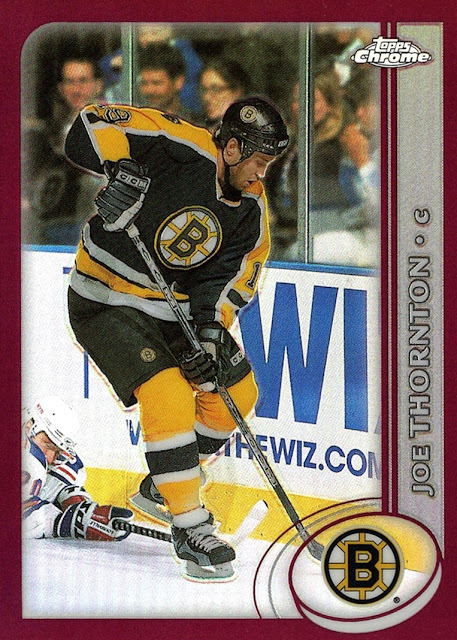 The Action Packed cards generally don't scan well, though, because the scanner picks up on the embossedness (yes, I made up a word- if Shakespeare could do it so can I) and puts weird white lines on things....like his chin and nose. Almost like a reverse shadow. 1992 would turn out to be Kyle's best Cup season. 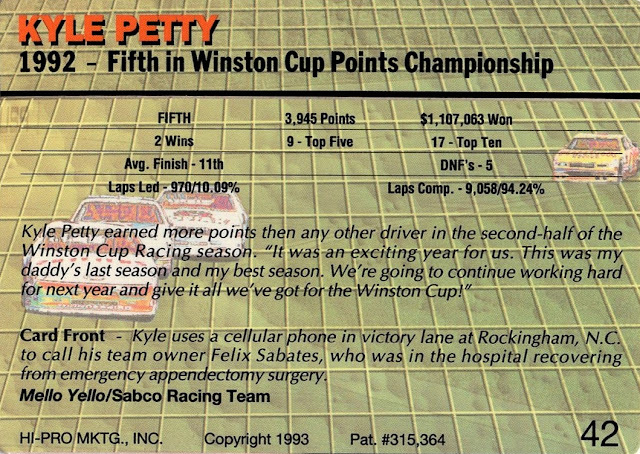 Under the points system used from 2004-14, he would have won the Cup championship, in fact. 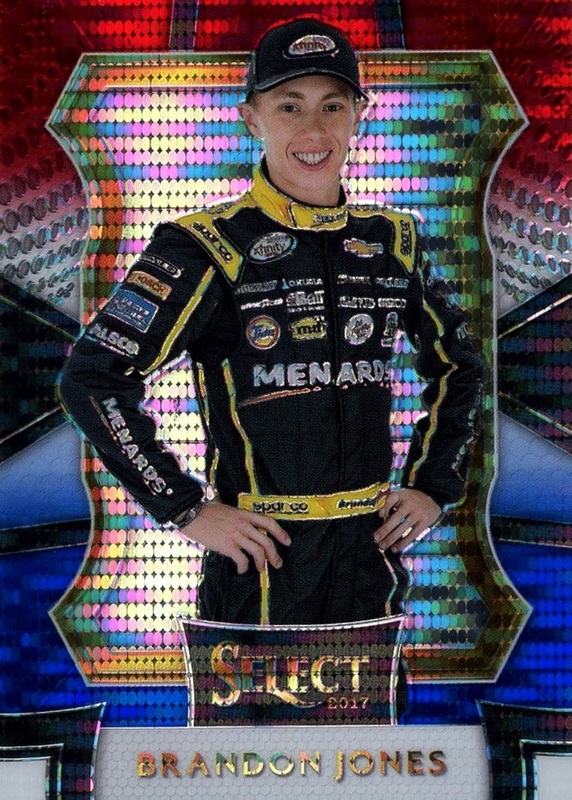 He raced until 2008, and is currently a broadcaster for NBC. He still has the same haircut, although now it's kept in a ponytail.And is much grayer. 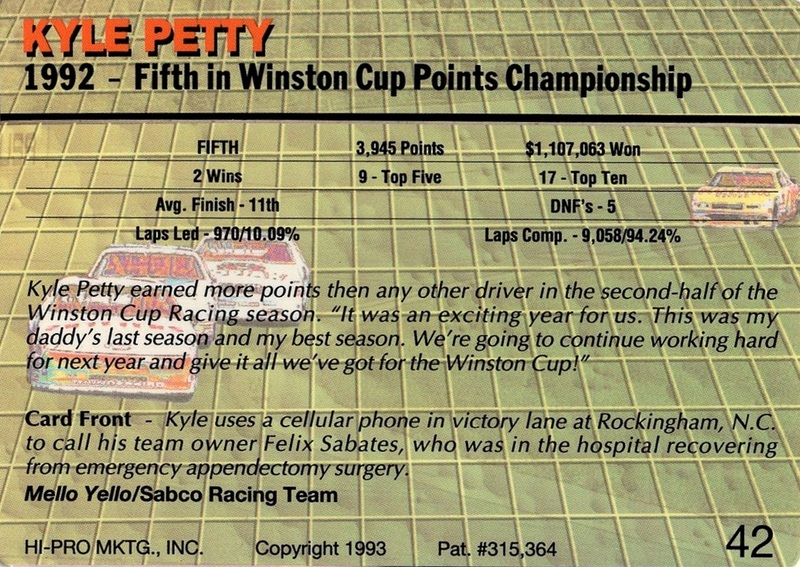 Felix Sabates still owns a portion of this team, now driven by Kyle Larson, although Chip Ganassi is now the primary owner of the team. An upgrade hiding for 14 years in my own collection! I have not really talked about it too much, but I have a huge stash of duplicate cards sitting in my storage unit. I don't know exactly when I last saw them, but I'm guessing it was in 2003 or 2004. I haven't seen them in years, until last year when we moved to a better storage unit. Yesterday (October 28th, not sure when I'll actually get around to posting this) I went to my storage unit and moved the model kits off them, and started going through them a little bit. There's going to be some loss- the previous storage unit was not climate controlled, so they were essentially exposed to the elements. There is a degree of "brickage" and the weight of the stuff has damaged some. Luckily, they ARE duplicates. At some point I'm going to cart them home and sort them...then compare them to my actual collection to see if there are any upgrades...or possibly variations. I know there will be...because I've found some already! 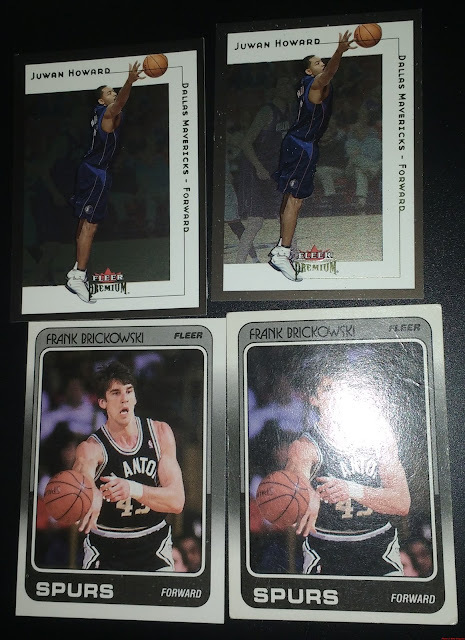 The Brickowski from 1988-89 Fleer was one I knew needed an upgrade for a while, and I found a small stack of the set in a box with a receipt from October 2003 in it, and was happy to have one of his cards in there! Believe it or not, I specifically tried to get the flash on the card to show the bends. It has 5 bends, all 4 corners are weak, and it has surface scratches. The Juwan Howard card was one I didn't know I needed to replace...I had, back in 2004, the last time I had been through my collection, left it next to one of the inserts from Stadium Club from around the same time period. 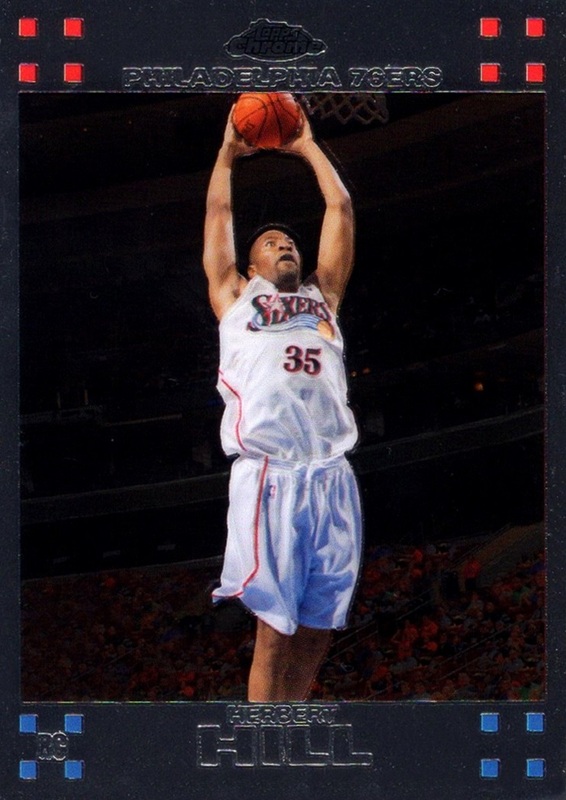 Unfortunately, those cards have gotten sticky and damaged several cards around them, including this Howard card. 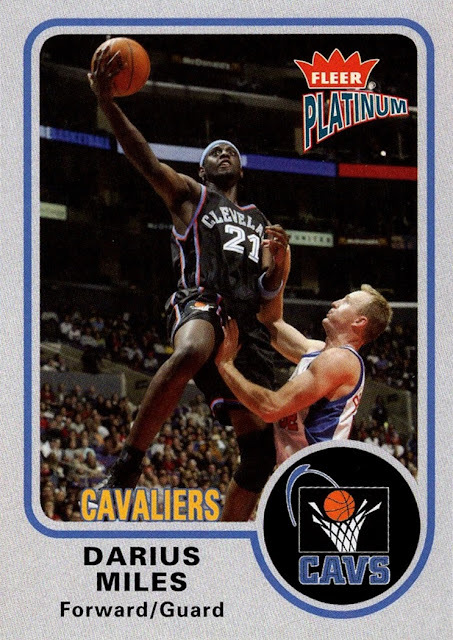 I found a small stack of 2001-02 Fleer Premium- surely the duplicates from the two boxes I did back when the set was new- and brought them home, because I couldn't remember off the top of my head WHICH card was damaged, just that it was a Maverick. I was in luck! You can see the white spots on the border and on his jersey. If anyone wants the two damaged cards shown above, I'd be more than happy to send them to you, but I'm not going to spend a lot of money on them, so it will be PWE. It's not like they aren't damaged already, afterall. 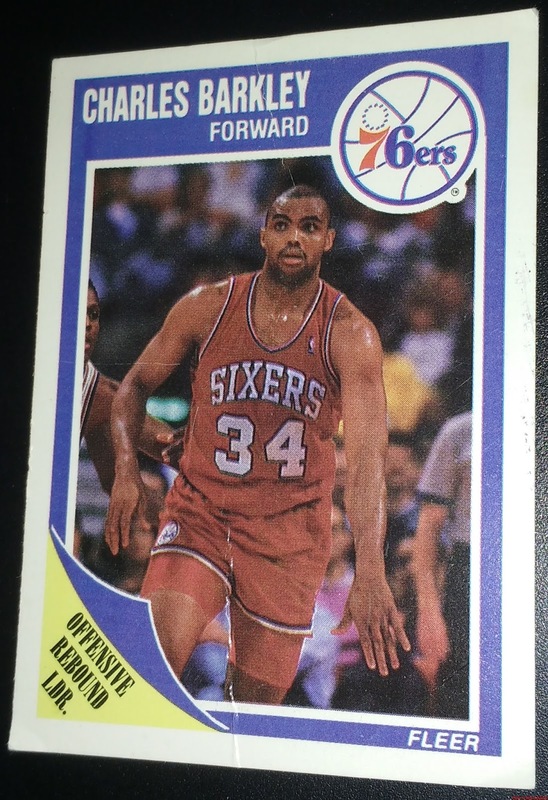 Unfortunately, I forgot to look for an upgrade for this Charles Barkley 1989-90 Fleer card. 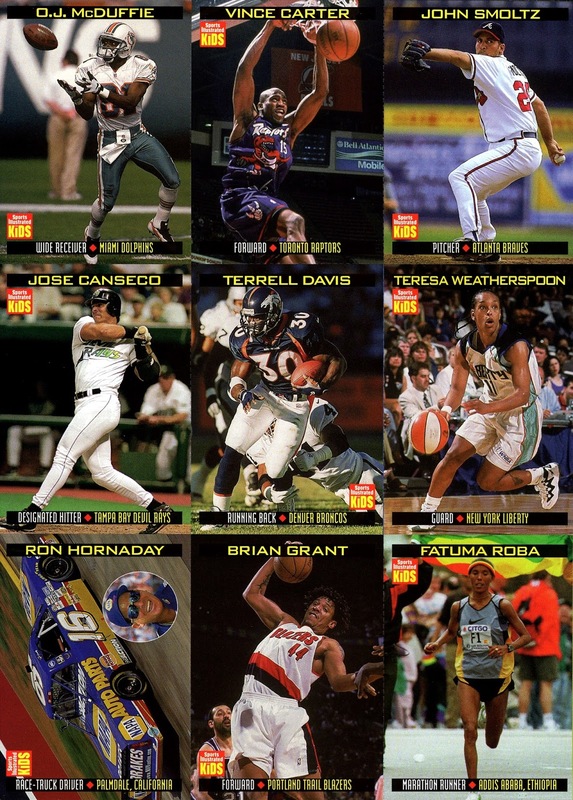 And I had a big stack of 89-90 Fleer in my hands, too...I simply forgot to look. Duh! The cards are easily accessible now, so going and looking would be pretty easy. Since I plan to go through the boxes in their entirety at some point, I probably won't make a special trip, though. This card has no less than 7 bends in it, plus the corners are all bad. I hope this isn't the best (Only) copy of the card I've got, but it shouldn't be too bad if I have to replace it at some point. I don't plan to do that until I am sure I don't have one already, and I'm not going to sort them until I finish scanning my collection...looking at 2021 or later, considering how many new cards I'm getting from friends and family members lately, but that is NOT a complaint! Ugh, that was painful to see. I'm holding two cards here, the rest are all stuck together, and pretty much all of them stuck together are too damaged to put on my tradelist. The cards that are in even stacks are mostly going to be OK...but the ones that slid around and were not even on the top, they are mostly going to be lost. Of course, I can't throw any cards away, so I'll still have them forever...unless I can find somebody who wants them...but once I get them apart, and make sure there are no variations here...I will be putting them in a box, and putting them back in the storage unit, and probably not going to look at them again for 15 more years. I'm not sure if you can tell, or are familiar with the boxes, but Avon used to send boxes that were a great size for card storage...I prefer to use them for my duplicates, and have for years. (Luckily, my mom was involved in Avon at the time so we got them pretty much every week). There are 7 of them...all full like this one. I don't know how many card each box holds, but 2000, give or take, is my guess. I didn't photograph them, but I also found replacements for three of the 2003-04 Topps cards that got destroyed in my flood of 2/5/15. I found some other interesting stuff, in the duplicate stash, as well. 1989-90 Hoops has some errors and variations, but my collection is documented on card number- if my records show I have a number, then any other copies of the card go into the duplicate box. One of the cards in 1989-90 Hoops is such a minuscule variation, the #115 card of Spud Webb was originally issued with the wrong date of his free agent signing. They later corrected it. I had the corrected version all these years, but found one of the error versions in my duplicate box. I also found, in a box mostly filled with empty toploaders, a German Collector's Choice card from 1994-95 and a football card I had no recollection of ever having. 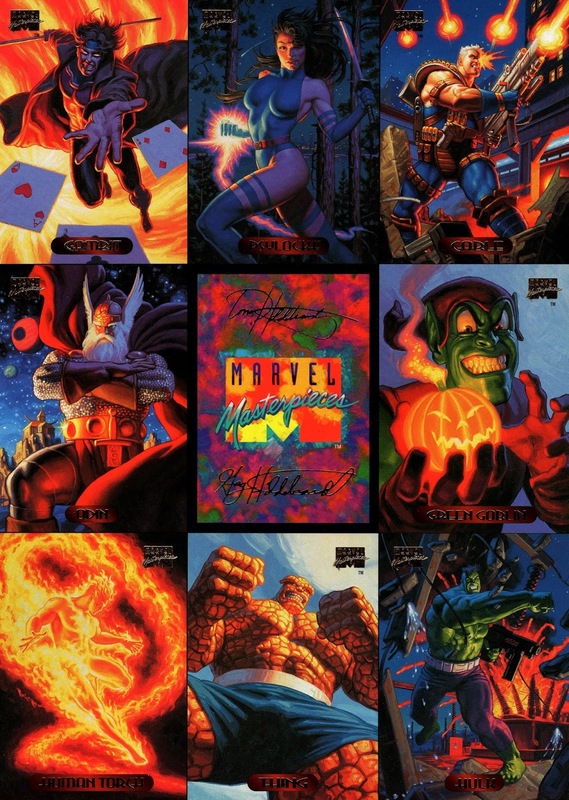 Back then, actually until a few months ago, I did not count the International editions of the Collector's Choice cards as part of my collection. Now I do! 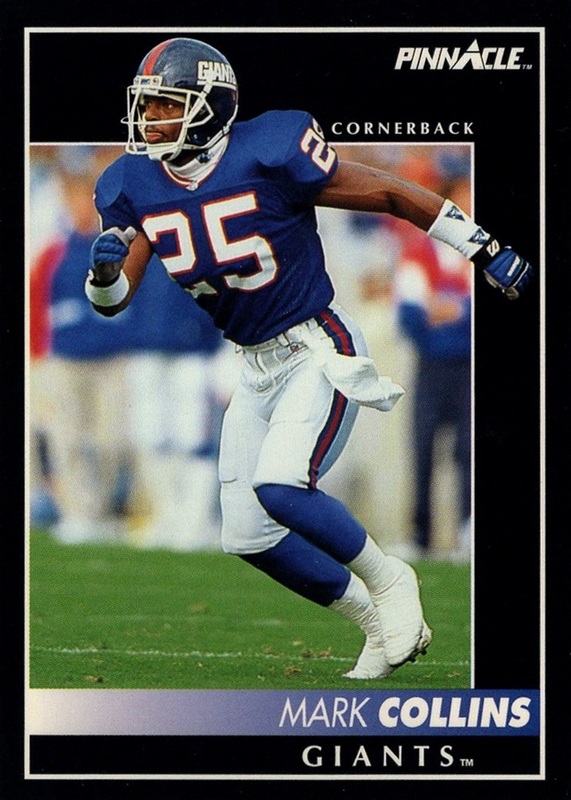 And anything that wasn't NBA or NASCAR I could care less about, which is how the football card got into a box with duplicates and empty toploaders. Now, I consider them both part of my collection, and even better, the football player was one I didn't have in my collection previously! Digging in some more boxes, and found some cards! I knew I had some of these, but no idea where...but some were a complete surprise to me, in that I didn't ever remember them existing! 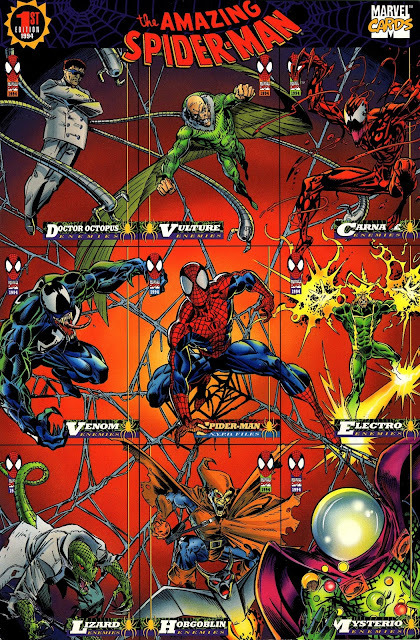 That's 7 SI for Kids panels, 4 Marvel panels and 1 TV & Movie panel. Of these I remembered some of the the SI for Kids panels but not all of them- there's one more I've held back for a future post- the all-Jordan page is from a publication called Sports Illustrated for Kids Extra, a title I had absolutely no memory of whatsoever. 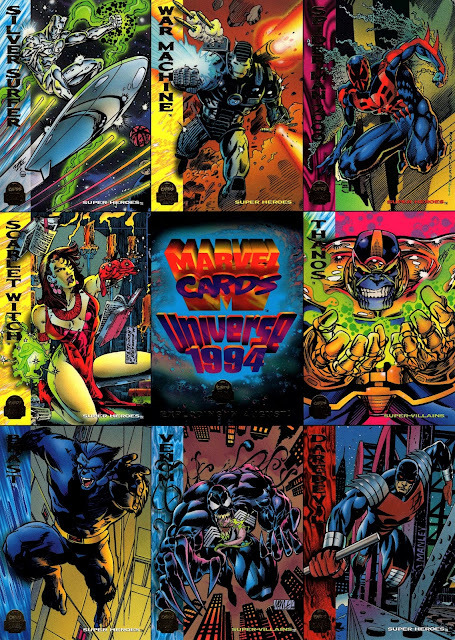 I did not remember having a panel for 1994 Marvel Universe, probably my all-time favorite comic set, and without question my all-time favorite Marvel set. 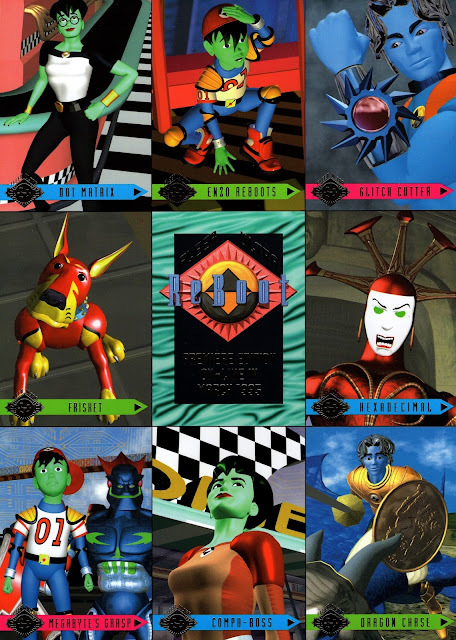 I'm six cards short of completing it- I need to hunt them down. Back in the day I separated most of the SI For Kids cards, damaging them more often than not. I'm glad I didn't do all of them. These were all still in the magazines except for the top one, which I found a second copy of still in the magazine. 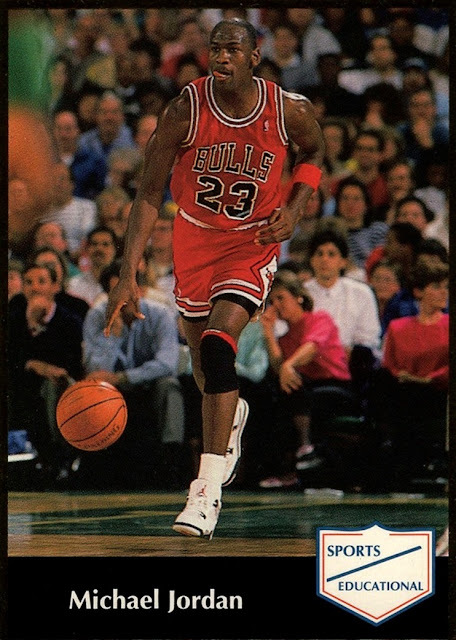 I also found another duplicate and a duplicate copy of the Jordan card issue. Not sure how I got duplicates as I had a subscription, which I let lapse in 2000. I only have vague memories of Reboot but I remember it being pretty good. I have a bunch of empty 9-pocket pages available. They are probably a little dusty, but they should be usable...maybe one or two rejects. 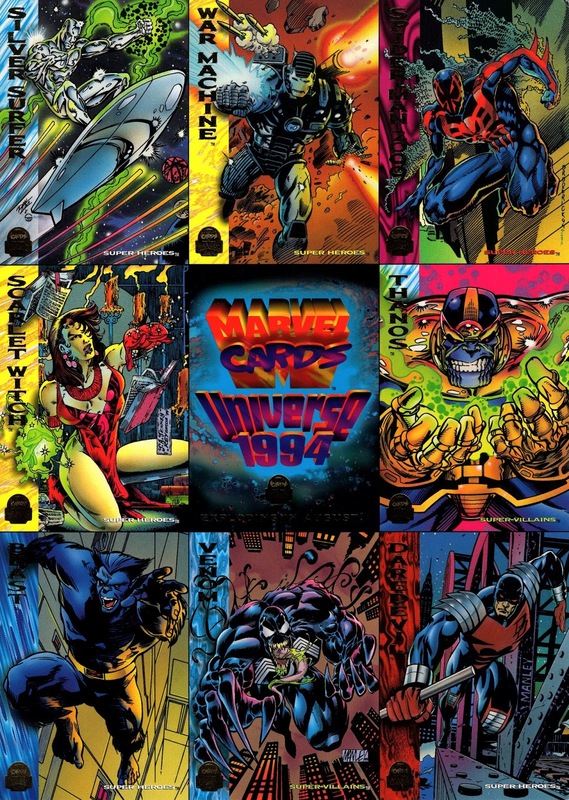 I used to store my cards in them but I took them all out in the year 2000 and have been storing the pages ever since. So I'd like to offer them up to whoever wants them. Send me something in return if you want to. I collect NBA/NHL/NASCAR/ Some non-Sports. I also owe people some thank yous so if one or more of you wants them, that would not require a return package. 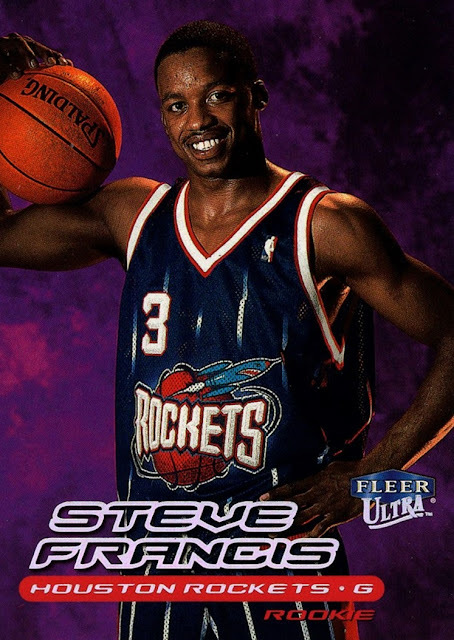 I'm also open to an open ended trade where if you don't have anything I want right now, you could always keep your eyes open at future card shows or if you ever come across something interesting in my sports. There's 7 binders worth so quite a few pages. Most are probably Ultra Pro but I didn't take the time to look. Binders themselves are NOT included. They've never been around cigarettes or pets, ever. Never been wet or any other damage. I'm not going to go nuts shipping them, I plan to do it the cheapest way possible. But, these pages are flexible so they should not be damaged. The USPS has a bag-type shipping method that would be the perfect size and will probably be used. I would ship outside the USA. I would also be willing to break them up and send some to multiple people. Nothing more needs to be said! While most of my posts about my biggest COMC order have covered various specific projects I've been working on, there were some cards I purchased just because...mostly because they were cheap, and I didn't have them. 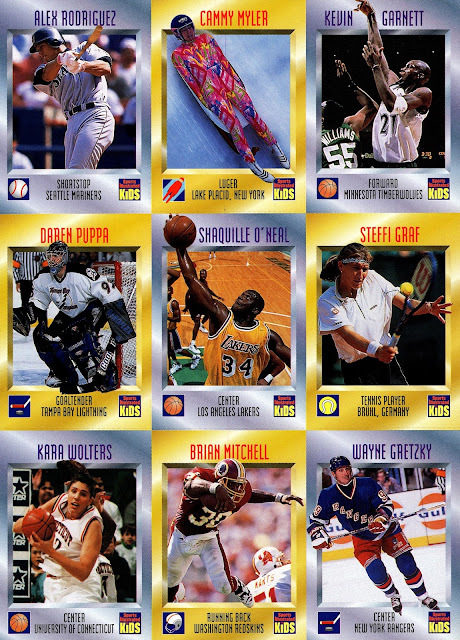 A few of them I purchased for the simple fact that they were the cheapest cards available in hockey...would have done that for NBA and NASCAR as well but I already had the cheapest cards available. 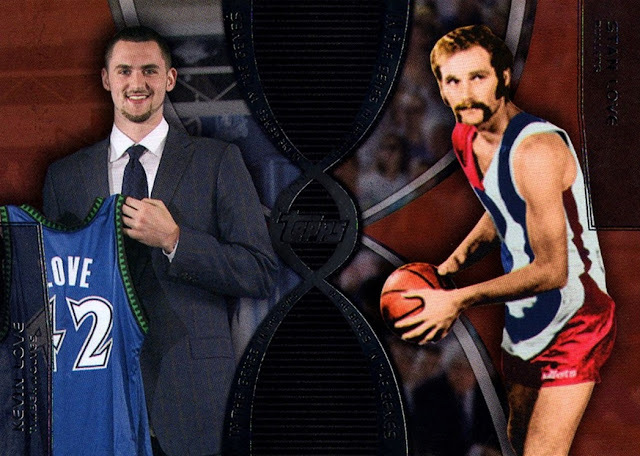 When I found out in December of 2016 that father/son NBA duo Stan and Kevin Love were actually distant cousins, I had to get the first card shown here, as it shows both of them. While I was at it, I picked up Stan's 1972-73 Topps card, which completes my Topps flagship collection of his...a grand total of 2 cards. 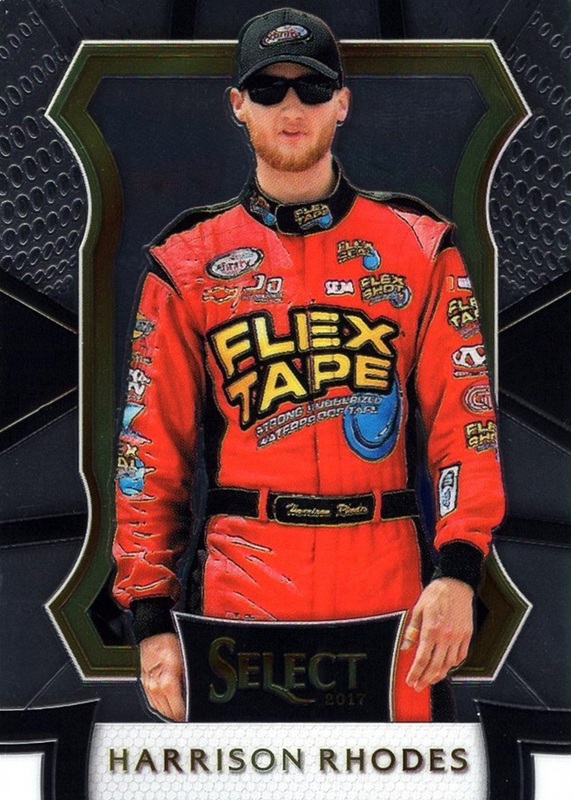 He only has one more from his playing career but it's a regional oddball promo and COMC has never even had one for sale, let alone currently available. 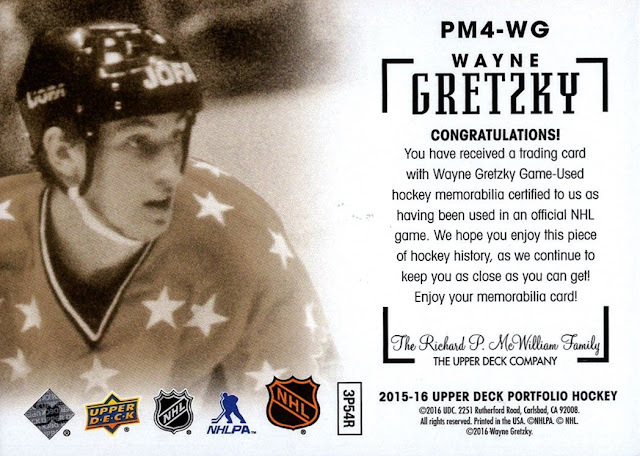 2015-16 Upper Deck Foil. Chosen for the picture. 2007-08 Topps Chrome. Hill had been missing from my collection. This card has been waiting for me since November 2016. 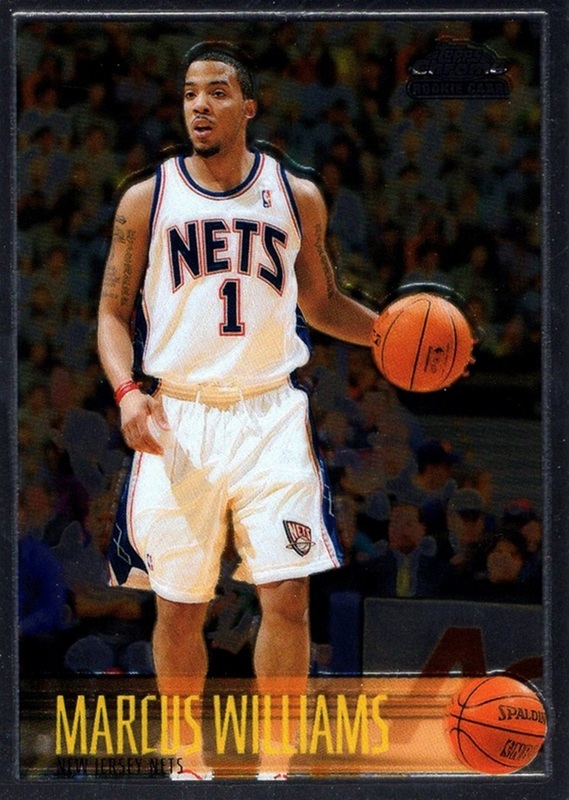 2006-07 Topps Chrome 1996-97 Throwback. A 10 card partial parallel, this is my second. I fully expect to complete the series via COMC at some point in the not too distant future. I just wanted to see what the blue holofoil looked like in person. A player I needed for my collection. He actually got a card in the original Bread for Health set, a vintage oddball set not in my collection that I would love to add one day. 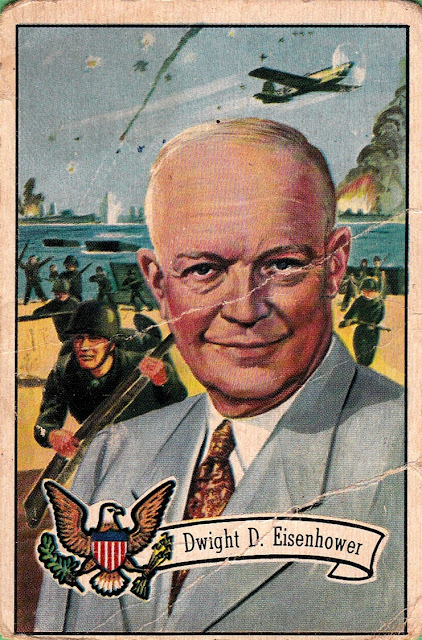 He passed away at age 87 just three months after this card was issued. I thought this would complete my set but I'm still missing Galen Young. Slowly working on getting all the Action Packed promos. Note that this car appears to be missing the spoiler. 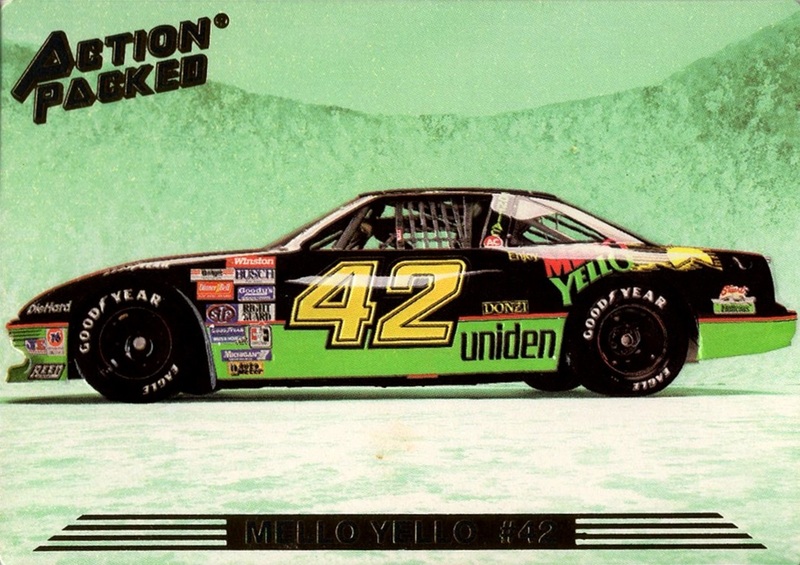 I had no idea this card, from 1994 Action Packed (perhaps my favorite NASCAR set) existed, until I saw it for sale on COMC. 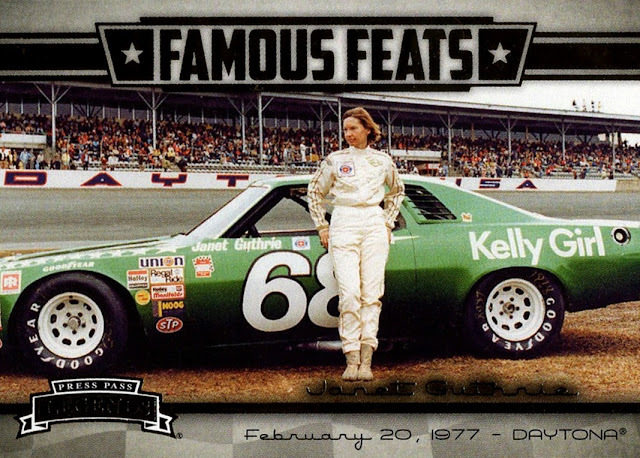 Not many cards depicting a Legends car. It is the only card she ever got. I had the gold foil version so I had to get the red one too. Members Only parallel. 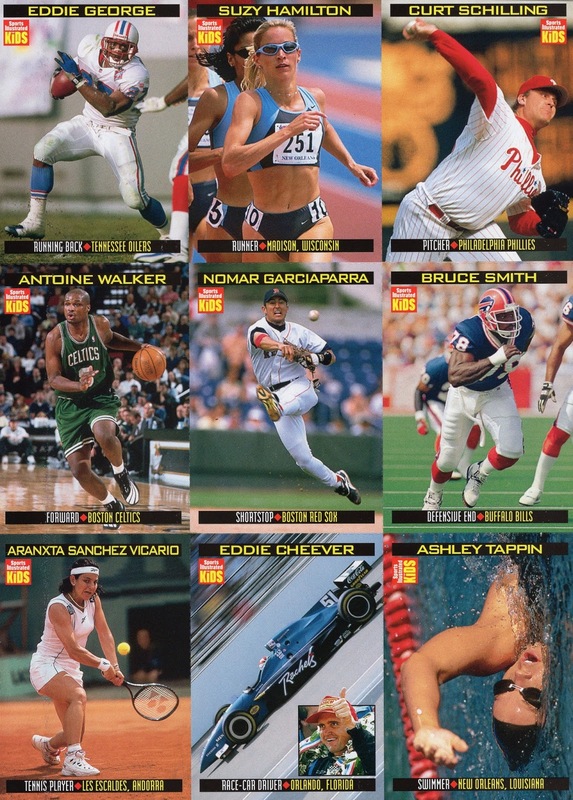 Kicking myself for not joining the Topps club back in the day. 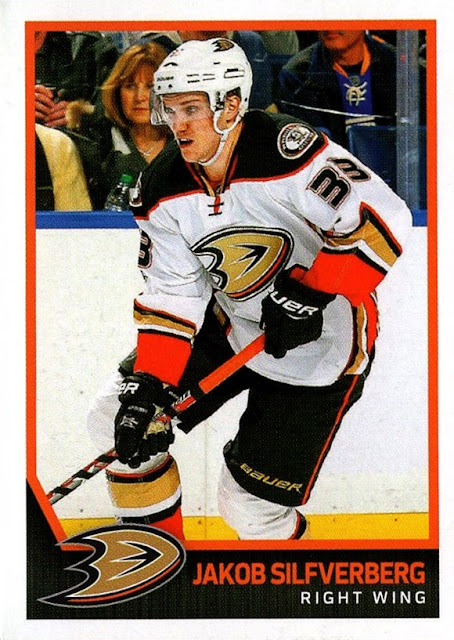 I wanted an NHL refractor, so I bought the cheapest two on COMC. Green has always been my favorite color, and I didn't have any of the green parallels from 2011 Element. Now I've got two! Completed 2013-14 Hoops! Interestingly, I purchased this card on COMC from someone I'm friends with on Facebook. I really have no idea what this is but I HAD to have it! I didn't have any of the hobby version of the 2007-08 Ultra set so I got the cheapest one. 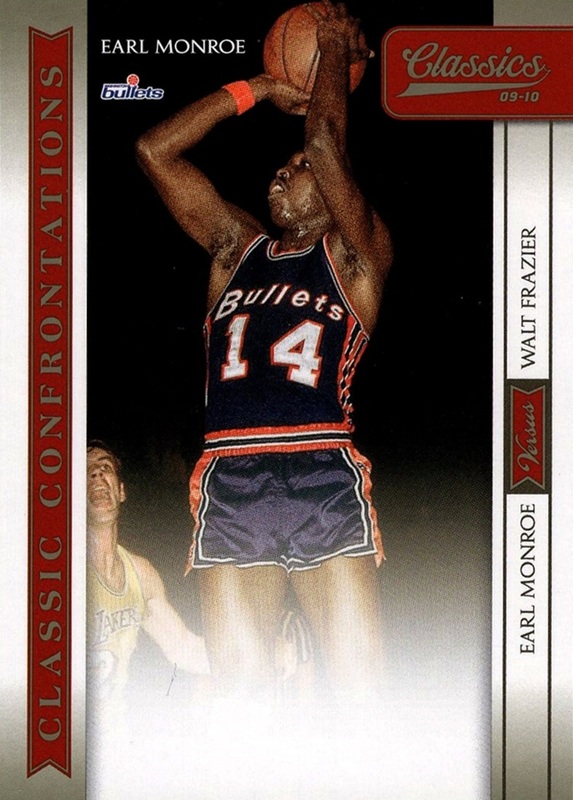 This was the next to last card I added to the order, chosen because the Bullets jersey shown here is rare on cards, and I will probably use it for my impending Uniform History post. Thought this was a neat photo. 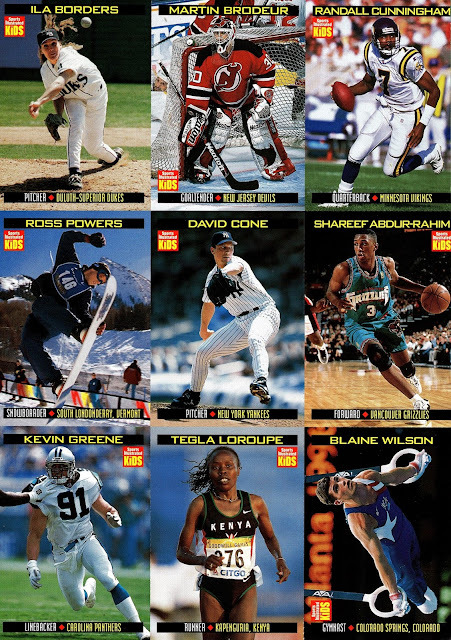 This completes the 1996 SI for Kids set. Although the above two stickers use the exact same design, they are from two different years. Once again they combine two teams onto one card meaning I can't count this as a Nets card. The Hawks I can due the other sticker being the NBA logo. 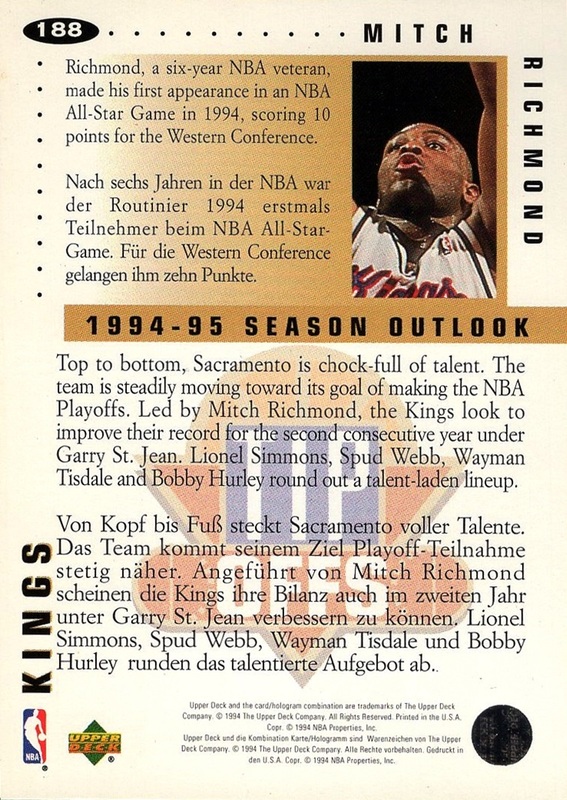 1994-95 Fleer European, my first card from the set. First card of Honka, I thought he had a funny name. Purchased because it was the cheapest NHL card on COMC. 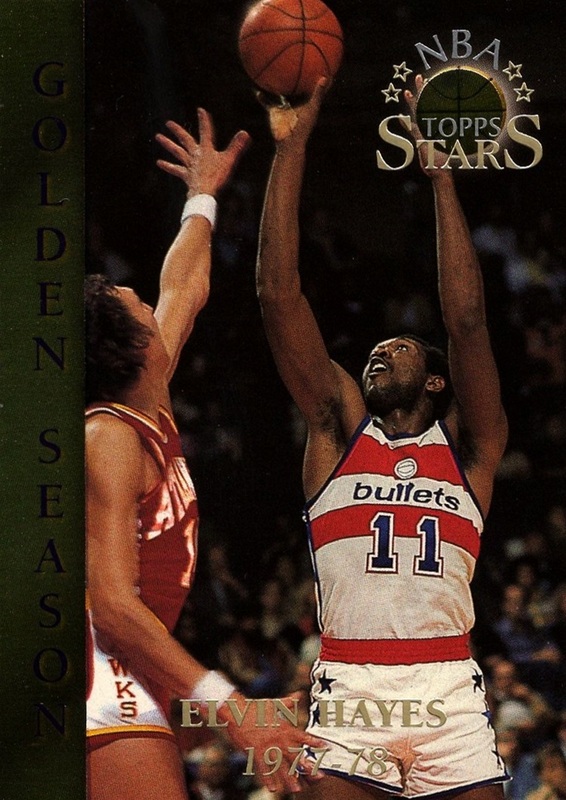 My first eTopps card of any sort, although the Greg Oden card got posted first. This was the first card out of the COMC order, and coincidentally the last to be posted, and you are stuck with a picture instead of a scan because of that stinking holder Topps has it in. How I loathe them. 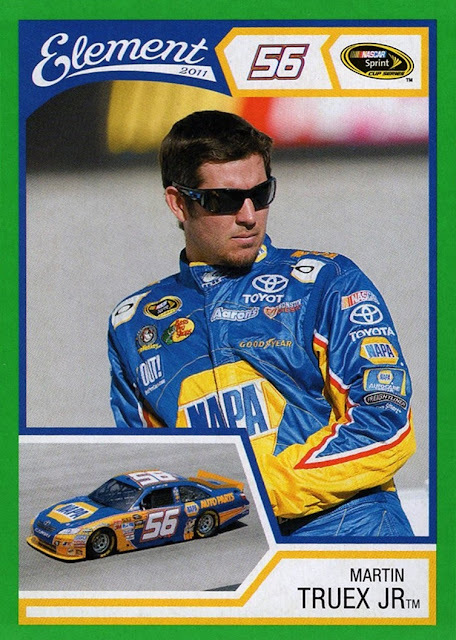 The 2003 eTopps set was the only set Topps ever did for NASCAR, and I didn't know it existed until I saw it listed on the Trading Card Database. I had to get one. 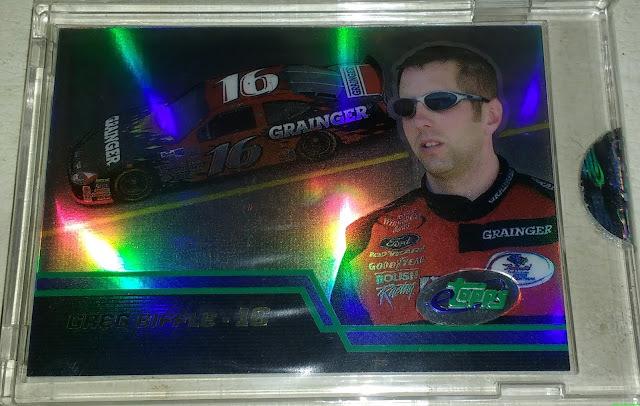 I wanted to get one that had been removed from the holder but Biffle was cheaper so I went that way. 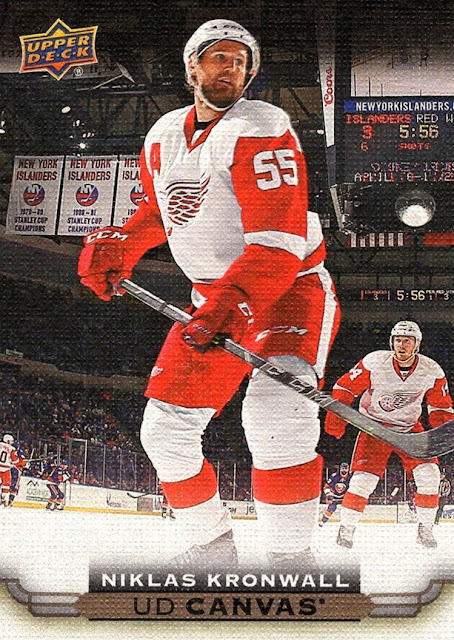 The cards, clearly, are printed with Refractor technology. It is not serially numbered. 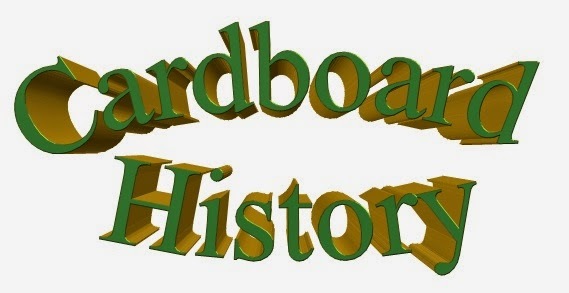 And now, finally, the largest COMC order I've ever made has now been fully documented on Cardboard History. It took me a lot longer than I expected...I began posting them in August, and it's now November 1st. My original plan was to post these daily while I was in Lake George, so I could keep the blog going while I was away from my scanner for 11 days. Instead, it took me into 4 months. That means I'm actually going to have to start writing posts again, as I wrote these all in August! I already have 15 cards waiting at COMC for the next order...I may not do such a breakdown like I did here, but then again...I might...because I sure did enjoy this whole process.